This week at St. Earth, in a flagrant reversal of last week's plan to keep my regular posting schedule through the holidays, I'm combining the last two weeks of December into one. (Wouldn't that make it "These weeks at St. Earth"? Somewhat less elegant, I think.) This is because it's hard to get a rhythm going in the studio between the end of the sale and the holidays, so I've yet to get back to making pots. I worked another week at the dayjob, where my main project is building out a new webserver for the university. This is very technical and involves a lot of testing and troubleshooting -- good for stretching my brain. My interest in the web and digital technology still runs a distant second to clay, but it's a good second. Then it was off to California for a week, to spend Christmas with my family in San Diego. The weather was a fantastic change, and it was restful and nice to be away. We even ate at a Thai restaraunt called -- I'm not making this up -- Celadon. The lull in the studio has prompted some end-of-year musings. For example, once the sale weekend is past, I usually survey the showroom and the pots that are left. It's interesting to wonder why one pot sold and another didn't, and to see the odd ones that have lingered through multiple sales, waiting for just the right person to come along. I think there's a person for every pot, and vice versa, but sometimes it takes a while to make this match. It's bittersweet to look at the empty shelves, remembering the pots I was really pleased with that are now gone. From a business standpoint it's great to sell as many pots as possible, but I like the showroom best when it's jammed full and I can stand there surrounded by many month's work. I'm in the habit of jotting down ideas in the studio on whatever surface presents itself at the moment, including the canvas cover on my main work table. There in the top corner, now so faded with age as to be barely legible, it says "How to be one show ahead?" Clearly, I'm still trying to figure it out, and I often wonder if I ever will -- building a reserve inventory has become my White Whale or Holy Grail. This is partly because my pots have been selling at about the same rate that I can make them, and partly because my output is limited by splitting my time between the studio and other projects (outside jobs, freelance design work, barn renovation, etc.). Getting ahead would improve my making process in many ways, such as having less anxiety and rush before each big deadline; working in larger and longer series; firing in the best weather and on a more convenient schedule; having more pots available in my site gallery; and having more variety in the showroom at any one time. And so... I look ahead to the next making cycle with anticipation and excitement, hoping I may get a bit farther ahead of the curve, but suspecting that the goal will remain elusive. I'm also looking forward to putting together the Archive Gallery for 2007 -- I think I made a lot of good pots in the past year. It's really informative to review my recent pots from that perspective, looking for trends and opportunities, ways to capitalize on the things that were successful and to avoid the things that weren't. This also helps plot out an arc of future potential, an imagined direction for where my work as a whole is going. Lastly, from the Department of Meta-Blogging, I thought I'd share an update on my site traffic (via Google Analytics). With 6 months of data, there have now been a total of 2113 visits by 734 unique visitors. Two-thirds of those have come in the last 3 months, so the rate is increasing at a good pace. That equates to an average of about 10 visits a day, with a high of 34 just after I sent out sale announcements in early December. So I think I can now safely number my readers in the tens, if not dozens. Most visitors have come here via links from my main site or bookmarks, but 33% are referred by Ron Philbeck's blog and 10% by Emily Murphy's -- I'm very pleased to be associated with fine potter-bloggers such as these. Surprisingly, only 6% of my visits come from Google searches. 85% of visits are from the US and 7% from the UK and Canada, but the top 10 include Brazil, Switzerland and Germany. All of which is great to see and very rewarding -- thank you for reading! This week at St. Earth, with the sale comfortably past, things slowed down to a more manageable pace. 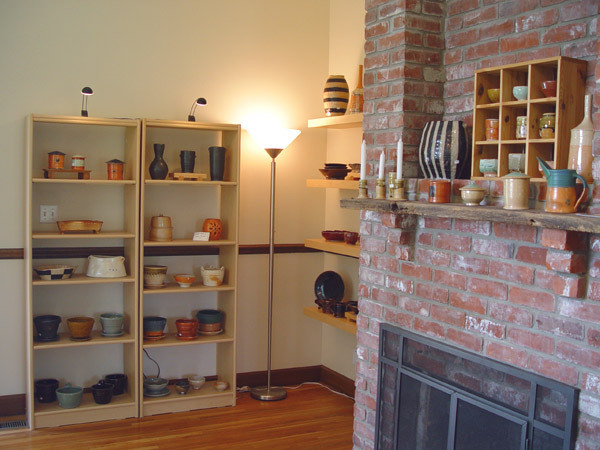 I did a lot of miscellaneous follow-up stuff, like packing and shipping pots purchased from the site gallery, rearranging the showroom and sorting out some of the chaos in the studio. It gets to be pretty wild in there during the weeks before the sale, since I'm usually just barely getting each thing finished and moving on to the next without cleaning or straightening up in between. 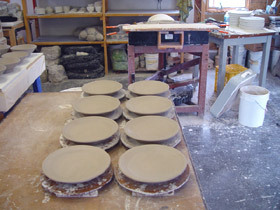 After several weeks of glazing, firing, promotion and sale preparation, I can't wait to get back to the wheel. 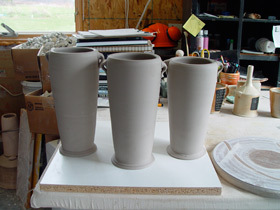 The best reward is that now I get to start thinking about the pots I'll make when I get my hands on wet clay again. Throwing is my favorite part of the entire process, and the anticipation of what comes next is a close second! I had some results in the last couple soda firings that I'm excited to explore further. The Turner porcelain body test looked really promising, even without slip or glaze -- the bare clay came out a pure, glossy white, but with the subtle surface qualities of salt and soda, rather than like a clear glaze. Some of my latest decorative schemes turned out really well too, so I'm looking forward to playing with the possibilities. For me, that's an iterative process of taking a good initial idea and then finding new combinations and extrapolations of it that refine or stretch its potential. Since most of these start as small, simple tests, an interesting part of this is exploring the options for translating a new pattern to other forms. A decorative scheme that works well on a vase, say, may be very different applied to a bowl or lidded jar, where other parts of the form have to be considered and accounted for to achieve a dynamic, cohesive whole. The integration of form and surface is a constant challenge, but is really powerful when it comes together. Things around the studio will be slow until after New Year's -- it's always difficult to get a flow going between the end of the sale and the holidays -- but I expect I'll think of something to report in the meantime. I'm sticking to my one-post-per-week rule whether I've got anything of substance to say or not! One thing I really like about selling pots directly to a local audience is getting to know my customers; there are a few who have probably been to all 15 studio sales! (The first one was in December of 2000, which now seems like ages ago.) It's fun to see people again, including many of our friends, and I love the opportunity to talk about pots. It's great to hear how previous selections fit into people's homes and daily lives; or how they were received as gifts; or about the occasional favorite broken coffee mug -- what the person liked about it and what it will take to replace it. This is the kind of contact with customers and immediate feedback that people in other industries would kill for, the things no focus group or telephone survey could tell you. And, incidentally, I think this underscores some of what's wrong with a culture in which almost every object we buy is mass-produced, anonymously distributed, and casually thrown away. Making pots by hand isn't much in terms of a protest against this overwhelming trend, but it suggests that there are alternatives. Another trend I've noticed lately is that more of my customers are my age or younger. (Granted, I'm rapidly approaching the middle of the demographic curve! It's hard to believe I'll soon be in the older half of the population.) But I take this as a positive indication of who my future customers will be, and that the general interest in having handmade objects is alive and well. It may just work out that today's kids -- who we now entertain with crayons and play-doh while their parents shop -- will come to buy pots for their own homes some day. 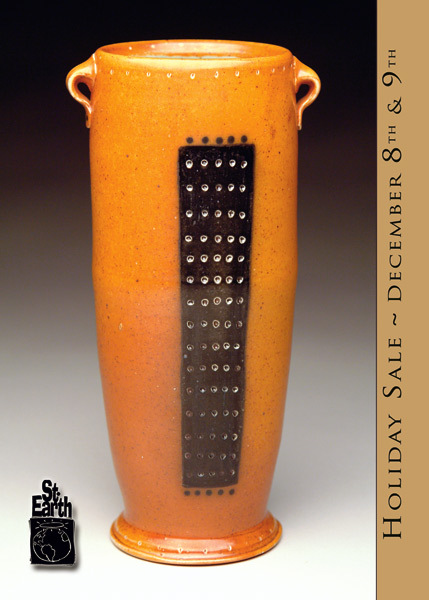 This week at St. Earth I continued preparations for the Holiday Sale at a hectic pace. Time's getting short, and there's so much left to do! 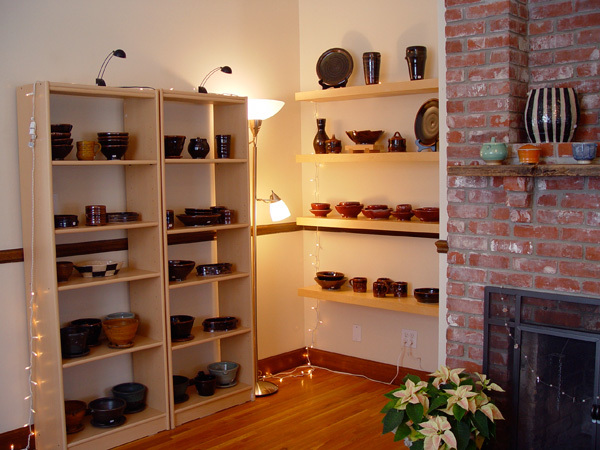 I added photos of new soda fired pots to the Gallery, mailed out announcement cards, finished the last firing before the sale, put cane handles on some oval basket forms, and started rearranging the showroom, cleaning, putting up seasonal decorations, etc. 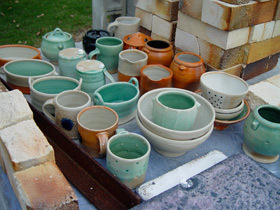 The firing was really good, with some great new pots for the sale. That's a nice way to end the year's firings. That's all for now -- I'll leave the rest to the photos. This week at St. Earth I took some time off for the Thanksgiving holiday -- one last pause before the two week sprint to my sale. For my local customers, the 9th Annual Holiday Sale will be December 8th & 9th from 10am - 6pm. Here are Maps and Directions and some additional info about the sale. I'll be adding photos of new soda fired pots to the Gallery next week, if you'd like to preview the sale or place an order from the site. The announcement postcards arrived from the printer this week and they look great. It's always a relief to see them in hand, since the intricacies of digital color management are so arcane and unpredictable. I do my best to make things look right on the computer monitor, then send off the order and keep my fingers crossed until they're done. 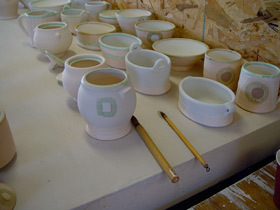 In the studio this week, I started glazing pots for the last soda firing of this sale cycle. The pots from that weird bisque seem OK, but it's hard to tell how close they got to normal temperature (cone 08) just by looking and feeling. 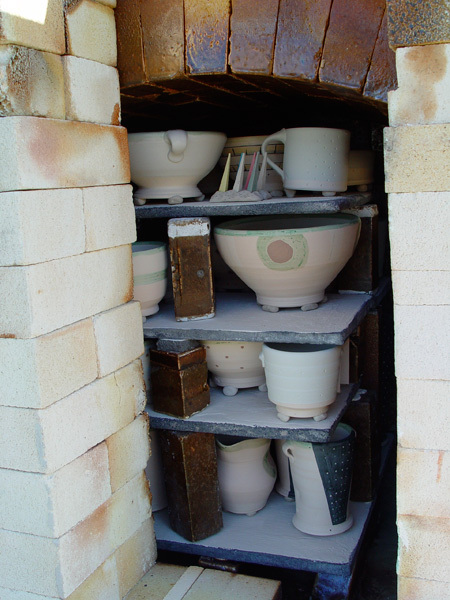 The trick here is that the temperature of the bisque firing determines the porosity of the pot for glazing; underfiring makes the pots more porous, so they absorb more glaze than intended (and vice versa). 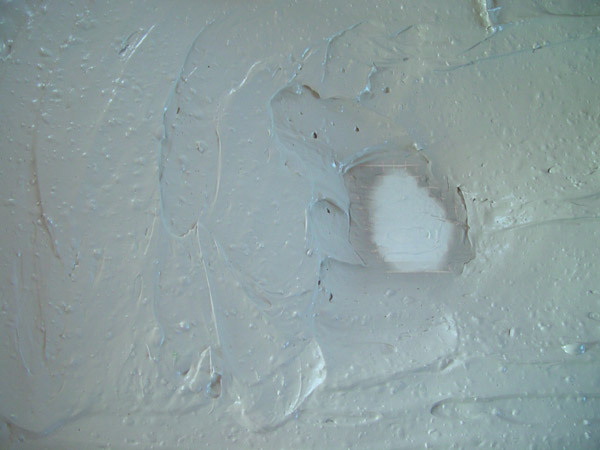 Since glaze thickness is critical to getting the expected color and surface results, this is a variable that's hard to work around, and that's equally difficult to test for. So... I'm going to hedge my bets by saving some of those pots for a later firing. I've got enough left from previous bisque loads to fill the soda kiln, and would rather fire the questionable ones later than risk ruining the whole batch. No more info on my electric kiln yet -- since I won't use it again right away, it will probably have to wait until after the sale. I do hate not knowing what the story is, though. My writing time may get sparse here over the next couple weeks, so I thought I'd share a couple other blogs about pots that I stumbled upon recently. The first is smokieclennel, about potter Tony Clennel's ongoing three-month trip to China. It has some great photography and observations. The second is Pottery: Mashiko Potter by Lee Love, an American working in Japan. He's been keeping this blog since 2004, and the most recent posts show some amazing photos of a show in Tokyo. Now that's how pots should be displayed! This week at St. Earth the 30 x 5 show opened at AKAR Gallery in Iowa City. I've only seen the show through a web browser, but they do such a fine job presenting the pots on their site that I'm only somewhat tempted to hop in the car and drive 6 hours to go see it in person. I'm really pleased that I sold 4 of 5 pots in the first couple days, and it's impressive to scroll the list and see not only the great range and quality of work, but how much of it is already spoken for. In the studio this week, my last electric bisque firing for the sale cycle went haywire, the kiln unexpectedly turning off a bit short of temperature, then with no response from the computer controller and a disturbing hint of electrical burning smell in the air. I unplugged it, flipped off the breaker in the panel, and have been yet to investigate further. You never know with these things -- it could be a $2 fuse or a $1000 controller. Fortunately, I think the pots will be OK to glaze and fire in the soda kiln; I'll have to guess at how underfired they were in the bisque and try to compensate some during glazing. That's a roll of the dice, at this point one I'd rather make than wait until the kiln's running again. I think. More on that next week. This week at St. Earth I fired soda kiln #25. 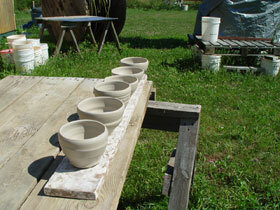 The weather was perfect for firing: cool, no wind and a 1/4 moon in the early AM sky. The schedule was right on again, which makes it much easier -- more like I'm working with the kiln than fighting against it. That makes me excited about future possibilities. I unloaded it on Friday evening and the pots were very good. Cone 10 went completely down on the top shelf, which fluxed the glazes completely and gave some good effects; the slips and salt interacted well, with good flashing and color; and there were just a couple losses. This load was mostly pitchers, mugs, oval baskets and serving bowls, so I should have a good variety of those for next month's Holiday sale. 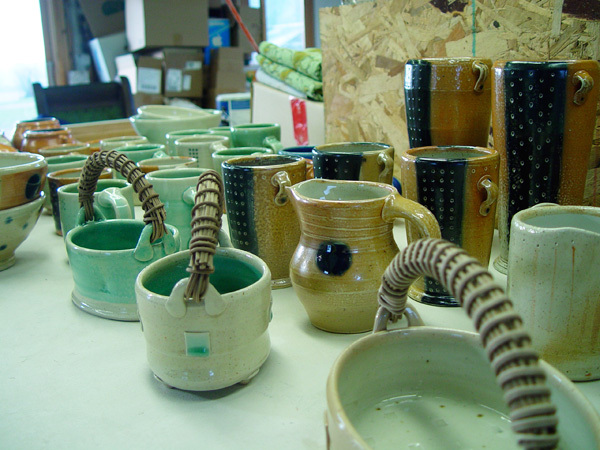 There's a growing group of new pots on a table in the studio, waiting to be cleaned up and priced, and after that the showroom will start filling up. I love it when all the shelves are full. Over the weekend I made what will probably be the last pots for this sale -- two groups of vases with some variations on my "domino" pattern. These are taking after the vase I put on the announcement card, which I made sometime last spring. I like to have some pots for the sale like the one on the card, but it's hard to take photos of new pots in time to meet the deadline at the printer. So I've started leaving time at the end of the throwing cycle to make a few more like it (last spring it was oval baskets). These vases will go into the last firing before the sale, probably right after Thanksgiving. Also this week, I packed up another batch of pots bound for Iowa, this time for Clary Illian's fall sale. 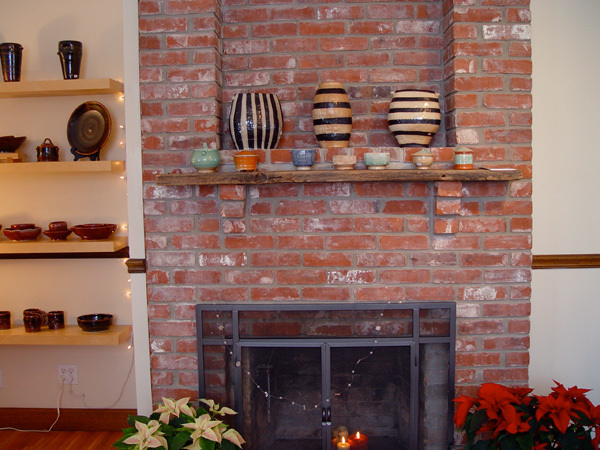 She's invited some of her former apprentices to be in her sale this year, and I am honored to have my pots in her showroom. 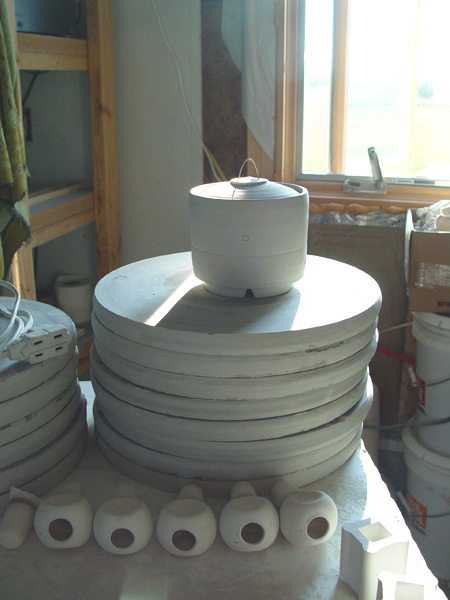 Back in August, I wrote about my two summers working at her pottery. That was the foundation for my career as a potter, and she is one of my strongest influences, so this means a lot. I sent about 20 pots and had fun choosing them, imagining how they'll look in relation to all the other fine pots that will be there. 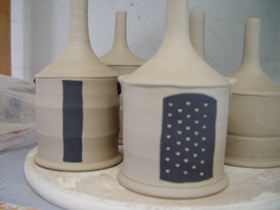 I really like the idea of the relationships between the pots, shared influences but different approaches and styles. Pretty great. I've expressed my admiration for AKAR before, and I have to say that I'm somewhat amazed to find myself here. 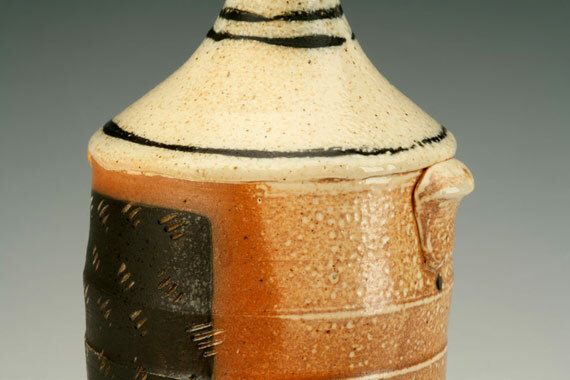 There are some great potters in this show! I fall alphabetically between Sam Chung and Val Cushing, which is daunting, to say the least. Sam was a grad student at Arizona State when I was there in '95, and I've admired his work ever since. 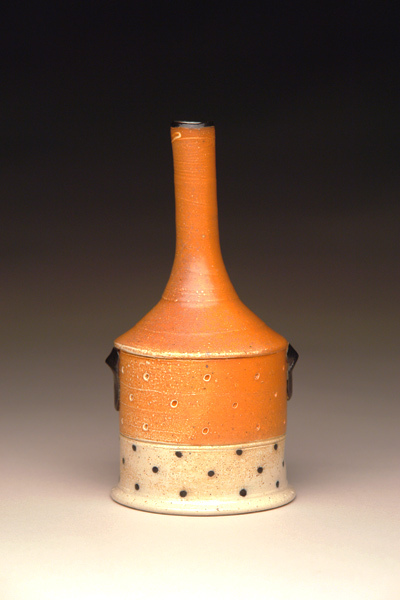 And Val Cushing... well, he's been one of the stars in the ceramics sky since I first learned what making pots was. 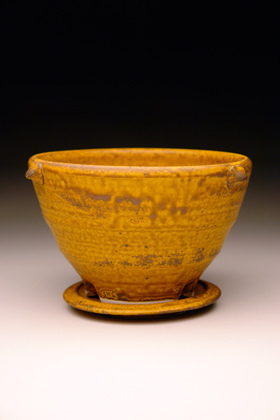 My first ceramics teacher, Bunny McBride, is also in the show and he was a student of Cushing's -- how's that for connections and influences between potters? This week at St. Earth I fired my soda kiln for the 24th time. 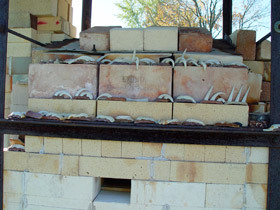 The firing went really well, which was a relief considering all the changed variables of a rebuilt chimney. Since this was the first time I've replaced the metal stack, it was encouraging that it fired very much like previous schedules. I take extensive notes on every firing, which make it easier to repeat good results and are particularly useful for troubleshooting during a firing. 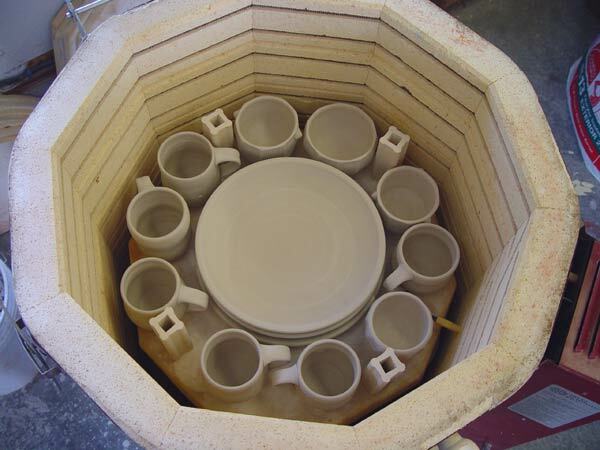 It's also great when they add some predictability to the process, like being able to estimate when the kiln will reach a particular temperature. Firing day is unusual: getting up in the dark to light the burner, a 3/4 moon in the sky above the barn; the early AM temperature climb, with slow bumps in gas pressure; the long afternoon wait, checking in each hour to make sure it's doing its thing; then the heat and intensity of throwing in salt burritos and spraying soda; and finally the wait for that last cone to drop, closing it up tight, the bright orange glow between every brick standing out against the night. After that, it's the slow burn of anticipation as all that heat drains away to where I can re-open the door and see the results. Firing is one of those experiences that is unique to being a potter, and that I imagine all potters have shared in one form or another, going back to a time long before cities or agriculture or writing. I unloaded on Wednesday evening and the pots were really good. 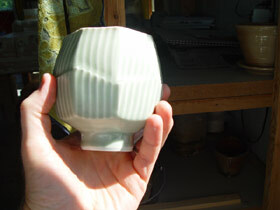 Some sweet results from my pale green celadon glaze, which is running just enough to make really dynamic drips. Good fluxing action from the salt/soda on the glossy black glaze, which I'm using primarily for dots and exterior decoration -- I like it best where the cobalt in it just starts to go deep blue at the edges. And some great directional flashing from the slips, where the side of the pot facing the fireboxes gets a heavy dose of soda, and the other gets blushes of color and subtle transitions marking the path of the flame. Over the weekend I glazed the next load, which is always the easiest time to do it, while all the previous results are fresh in memory. I repeated a lot of what worked well, avoided a few things that didn't -- the iterative process in action. Slow progress, like a marathon instead of a sprint. I also partially rebuilt the door, which takes a beating from the salt and soda since it's made out of insulating softbrick (it would last longer if I used hard firebrick, but the IFB retains more heat and is much easier to put in and out because the bricks are lightweight). The door was leaning outward, in part because of a sketchy cinder block foundation layer; that precariousness was making me nervous, particularly at cone 10, with 2300 degrees of heat behind it! I also rearranged the pattern of ports for checking cone packs and adding salt and soda, making them a bit more structurally sound too. Then I loaded it up again, ready for #25 next week. Outside the studio, the run-up to my Holiday Sale continues. I finished the layout for the announcement postcard and sent it to the printer (I've had great results from Modern Postcard in CA). 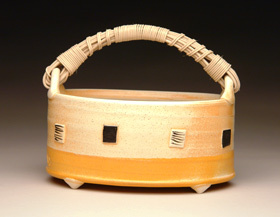 I chose a pot that went off to AKAR last month, and is one of my favorites from the last year. I'll mail the cards out later this month -- if you're not on the mailing list and would like to be, please sign up here. My time at the wheel is limited as I go into firing mode for a while, but I made some teabowls this week -- thinking ahead to the Yunomi show at AKAR in March. It's sure nice to have a good lead time for a show like that. It gives me time to think about options and try some new things. With November approaching, it's almost crunch time for my Holiday Sale, which this year will be December 8/9th. 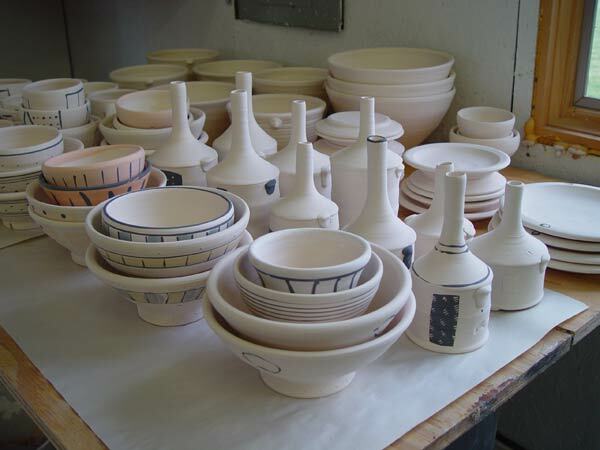 I always wish there was time for one more group of pots, one more firing, a few forms that I was hoping to get to before the deadline. Such is the cycle of the process; a time for throwing, a time for selling. It seems to have come fast this year, with strange weather adding to the confusion. 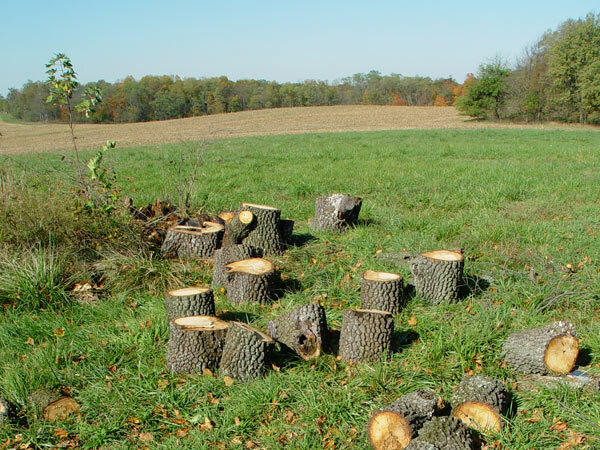 Here in Indiana we're caught in mid-Fall: wood stove season has begun, but mowing season's yet to end. The worst of both worlds! Not really -- I enjoy firing up the stove the first couple months -- but I certainly won't miss cutting grass for a while. And lastly -- if you'll indulge me in some meta-blogging for a moment --I've been falling behind on my posting schedule, to the point where as I'm writing this now I'm actually having trouble remembering what happened during the week in question. It sure helps to have date-stamped photos! I aspire to post in the early part of each week, but between the dayjob, the upcoming sale and so on, it just keeps slipping down the list. (Incidentally, this is why I've been neglecting the addition of an RSS feed -- or would that be even more reason to have one?) So, my apologies to any readers who've come looking only to find an older entry lingering at the top of the page. I can't say next month will be any better, but I'll get around to them all eventually. This week at St. Earth I glazed a group of pots for the soda kiln, which I hope to get loaded and fired next weekend. As I said back in August, I'm getting more obsessive about getting the slips and glazes exactly where I want them on the pots. This trend is great from an aesthetics standpoint, but it makes a slow process even slower (my need for variety and quest to make the most of each pot aren't conducive to a speedy workflow). 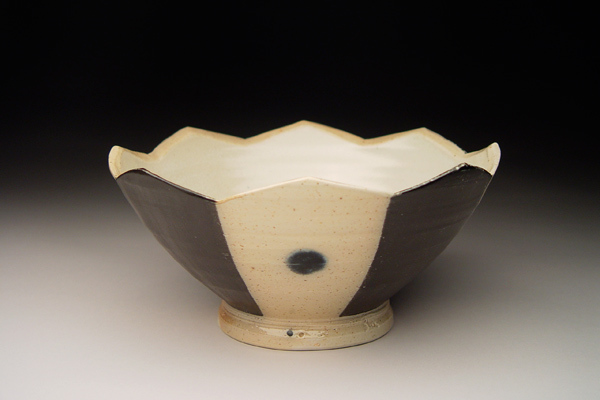 I like defined edges where a glaze meets an unglazed surface, like at the rim of the pot, where a liner glaze starts or along the line of a change in the form, like a horizontal band left by a rib impression while throwing or the point where a turned foot begins. To get this clear definition entails using a lot of liquid wax to mask off each successive coat of slip or glaze. (You can see it in the photos above as a blue area around the rims and markings; I add food coloring to the wax to make it easier to see.) While I wish that I could pour a liner glaze to an exact spot or dip an exterior glaze just so, in practice I have to wax over the area I want to protect. I had some nice feedback from a customer I sent pots to last week. Most of my sales are from the showroom, where I get to interact with each customer. I know they're getting what they expect, since they can hold the pots in their hands and compare the different options, and I've become used to that immediate feedback. However, like with everything it touches, the web significantly changes this transaction. It's a less personal experience via email and UPS, and I'm never sure if I've represented the pots well through photographs and descriptions -- I hate to think of someone opening the box and having the pots not live up to their expectations. So, hearing back when they are well-received is reassuring and rewarding. Also this week, the owner of Artifacts, my gallery in Indianapolis, came to the showroom for some pots. They seem to do really well with my small soda fired bottles, particularly the ones with lots of decoration. It's a form I enjoy making, but which I'm kind of ambivalent about because of it's limited function. While they work perfectly well as a single bud vase, for example, I see them as mainly sculptural, which puts some spin on the idea that I'm primarily interested in making utilitarian objects. Maybe they're the exception that proves the rule? Cindy took the "before" photo a couple years ago, and I really like it. 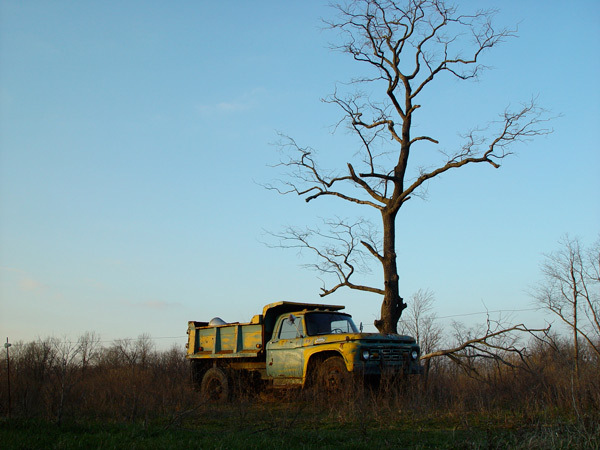 A good pair, that gnarled old tree standing behind Green Springs, our inherited and non-functioning dumptruck (the fading paint on the door can just be made out as "Green Springs, OH"). Now the persimmon is gone, and two young trees have grown up next to the truck, which makes for a different view out the back window of the studio. 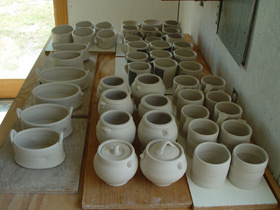 This week at St. Earth, I loaded and fired a bisque in the electric kiln, getting ready for my next soda firing. 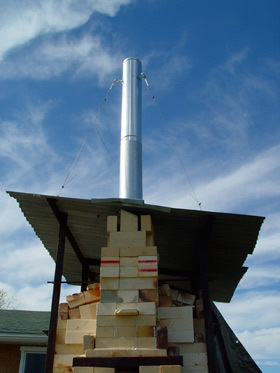 While that was going, I rebuilt the metal stack on the soda kiln. The previous one lasted about 10 firings, which isn't as long as I'd like, but the active equation here seems pretty clear: metal + heat + salt + water = trouble. An all-brick stack is a better way to go, and I'll do that when I build a new kiln next year, but for now I'm committed to metal (this kiln doesn't have the supporting structure to switch to brick). My hope is that going back to the original height will help get the top of the kiln to temperature, after that caused problems in my last firing in August. Every change to the kiln causes some unpredictable effects, even when returning to a previous design, so it's a gamble either way. With my annual Holiday Sale coming up in early December, it would be great to have a few good firings in the next month and a half. There are about 200 pots in the showroom at the moment, which is quite good for this time of year, but I'd like to get closer to 300 for the sale. In the studio, I continuing the trend of making pots with spouts, with a series of batter or mixing bowls. 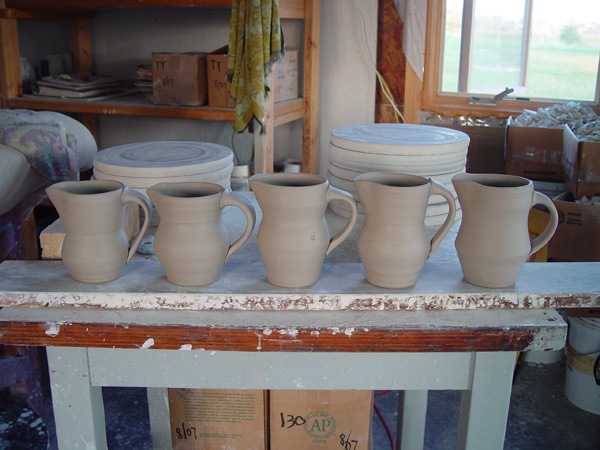 I like to do these with a thick, rolled rim and a lug at the back, opposite the spout, to give a good grip. The spouts are similar to those I pull on a pitcher, but a bit wider and slightly thicker. Where a pitcher is designed to pour liquids, these bowls are intended for a thicker consistency, like pancake batter, where a bigger pouring channel works better. Likewise, the lip doesn't need quite as sharp an edge to cut off the flow, and needs to be a bit less fragile on these, since they get knocked around a lot. These are the kinds of details that I think make the difference between a pot that works well enough and one that is really suited to its purpose. I also ordered supplies this week, from Continental Clay in Minneapolis. 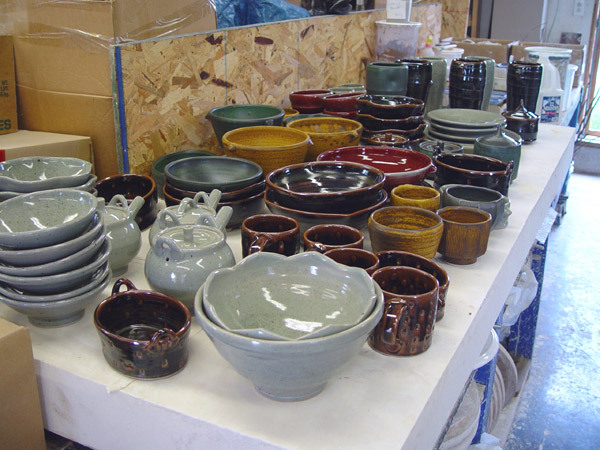 They're not the closest ceramics supplier, but I've had really good service from them in the past, they take phone orders, and I enjoy hearing that Minnesota accent every once in a while. I got some 400-mesh silica -- thinking it might smooth out some of the crazing in my celadons -- a few metallic oxides, and pyrometric cones. After getting down to my very last cone 10 recently, I like the idea of having enough on hand to last a couple years. Chris Berman: "We're back with breaking news about clay, and a huge stoneware showdown in Seattle." Mike Ditka: "The entire pottery community is gonna be watching this one." Text overlay: Lucky for us they chose football. Strange, right? I really don't know what to make of this. It seems like they're satirizing themselves, with the mock-serious tone, which is typical of promo ads on ESPN. But it also implies that taking pottery this seriously would be ridiculous; that if it's kind of silly for Ditka to get all worked up every week over football games, doing so over ceramics would be absolutely nuts. Perhaps I'm overthinking this? In any case, it's certainly funny, and clever, too. I appreciate that they went all out on the details. The announcers have dried clay up to their elbows. The stage set is wooden shelves full of pots, like in a group studio. The long desk they're sitting behind appears to be made of clay with a drippy blue glaze. And the three large jars in front labelled "Next - of - Kiln", with the "of" spinning on a turntable, are brilliant. (Although I think it's funny that if you pronounce "kiln" as "kill", it ruins the pun and makes the entire thing much stranger. "Coming up on Next of Kill..." sounds like a hunting show.) These details suggest that it wasn't just some random shot in the dark, but that someone there knows enough about clay to make the parody stick. Perhaps they have an intern who majored in ceramics? Then on the dreadful-yet-hard-to-resist Survivor, during a challenge in which the contestants smash ceramic vases to win an award, the host went out of his way to describe them as "porcelain vases". Again: what does this say about the popular view of ceramics? Are they described as "porcelain" to suggest that they have greater value, only to be shattered moments later? And does the average person think, "Ah, yes... porcelain! ", or does that just zip past unnoticed? Smashing vases in the first place seems like kind of an odd choice, but I guess it's mildly violent and visceral in a family-friendly kind of way. With the movie Ghost lodged forever in our collective unconscious, from here on out I suppose anything's possible. This week at St. Earth, as I was packing up my pots for the 30 x 5 show at AKAR Gallery, an invitation to their 2008 Yunomi show arrived in the mail. Excellent! It's great to be invited to shows, as compared with sending off applications and entry fees in what amounts to a roll of the dice. 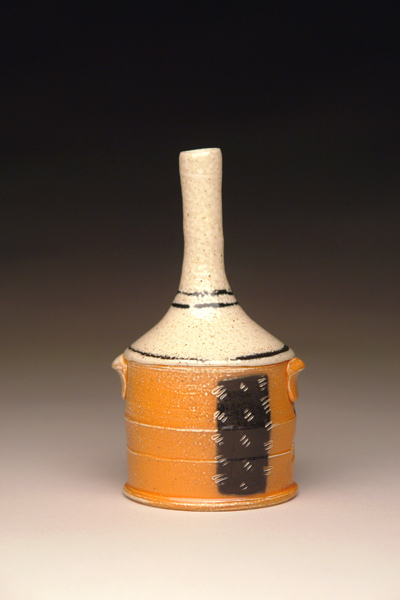 And as I've said before, I think AKAR is a very good gallery for pots, so it's rewarding to show my work there. 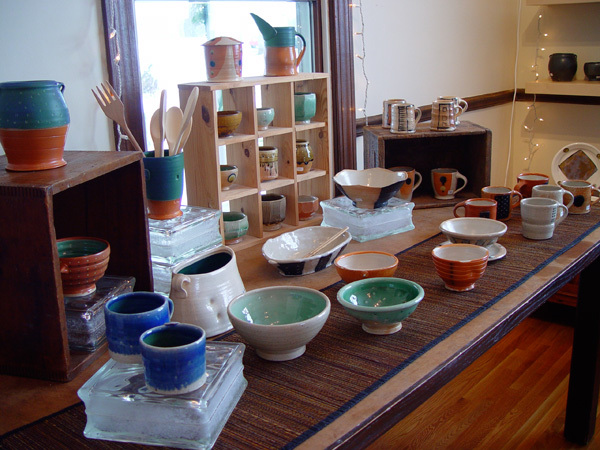 Here's this year's show, featuring 400 yunomis (aka teabowls) by 100 potters. That's a mind-bending array of good pots! I like how such a small, simple form can carry so much information about the style and intent of each potter. Apparently, next year's show will be online only, which I imagine avoids the logistical nightmare of presenting that many pots in the gallery at once. This is an interesting step for ceramics on the web; not that there haven't been virtual shows before, but I think it's significant that a high-profile gallery is starting to do both. Deciding which pots to send for the 30 x 5 show was challenging. 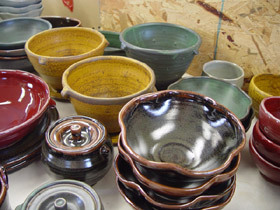 It's easy to tell the good pots from the not so good -- much harder to choose the very best ones. 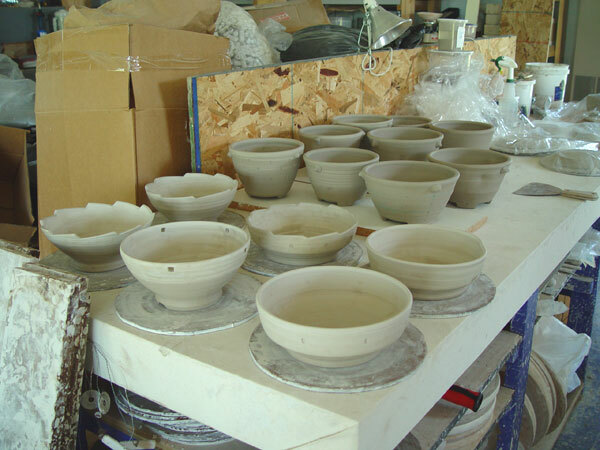 While doing this selection process, I realized that getting ready for a show means carefully evaluating your own work, trying to take a step back to see the pots from a wider perspective. It was great to have enough pots around that I had options, but options have a way of making decisions more complicated. 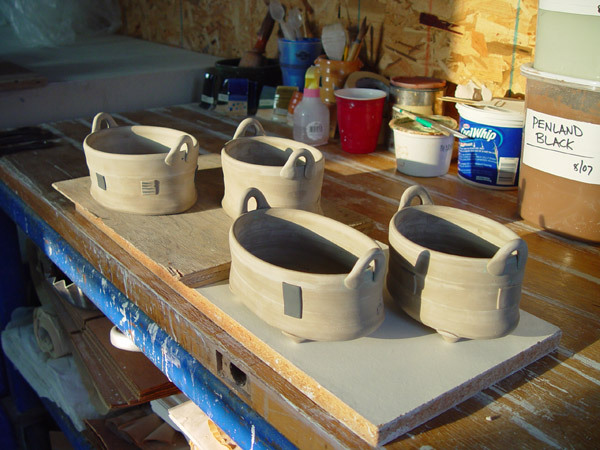 With five pots to send, I wanted them to represent my best work individually, but also to be cohesive and interesting as a group. 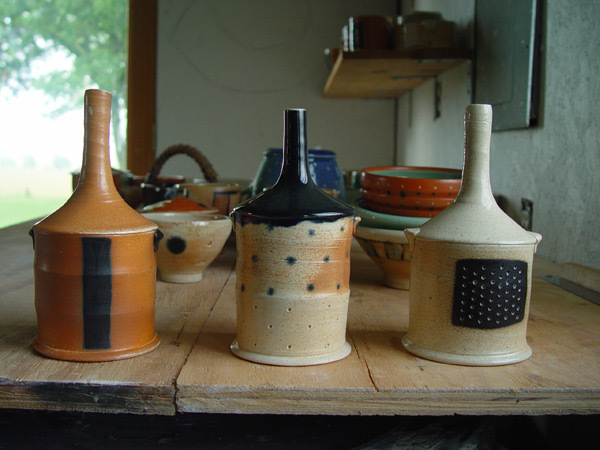 In the end, I chose all soda fired pots with black underglaze decoration -- that's where I think the best things have been happening with my work. Three bottles in various sizes, one vase and an oval basket. As a group, I like the subtle shifts in color from the bare clay body and flashing slips, and the repeated or related decorative elements. All in all, a pretty good set of pots, I think. I'll post a link to the show on their site when it goes up in November. In the studio this week, I got ready to load a bisque, gathering all the greenware that's dry enough to fire near the electric kiln. This is another evaluation point along the many stages of making pots, where I decide if any of the pots shouldn't make the cut. It can be hard to let go of the ones that are flawed but almost good enough (or that might have a chance to be good if they got lucky in the glaze firing.) But I've found that it's wise to scrap them at this point, while the clay can still be recycled and used again. Once they go through the bisque, I've made a permanent, solid object that either has to succeed or go on the shard pile. This irreversible quality of clay probably encourages constructive self-criticism and maintaining standards, which is good all around. Lastly, I made another group of pitchers, which I think got better the second time through. I like this idea of focusing on one form long enough to try several variations, and of also working in iterations -- finishing one group, evaluating the results and then doing it again. It seems like a useful way to connect ideas with results. This week at St. Earth, Fall finally arrived, after a hot and dry summer. Beautiful days, cool nights and a full moon in an early October sky. 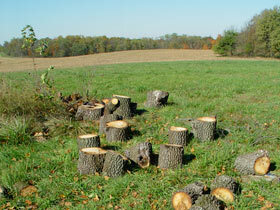 The farmers near us have started harvesting their fields. After months of quiet, gradual growth the huge combines and trucks come in for a day or two, transforming the landscape and leaving behind the rough stubble of another year's crop. It happens so fast, and is such a definitive mark of the seasons going by. 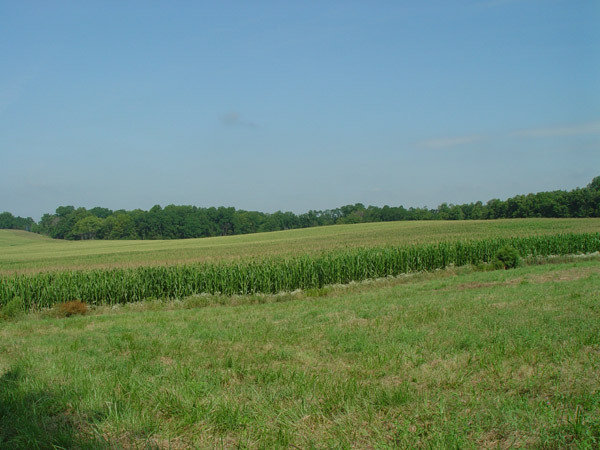 Now the trains that go past are louder, a half mile away, without the wall of corn to deflect the sounds of their friction on the tracks and horn blasts. This time of year makes me somewhat nostalgic, so it was fitting that I spent some time this week looking through my archive of digital photos, which go back to November 2000. (The first time I had access to a digital camera, and finally escaped the wretched days of slide film). It contains about 3000 clay-related photos, including my studio work in progress, firings, finished pots, sales, trips, workshops, shows, studio renovation, kiln construction, and so on. It makes for quite a compelling trip down memory lane, reinforcing where I've been the last seven years. A large number of them are scattered about this website, but I'd like to eventually consolidate them into some photo galleries, too. There are so many pots in there that I'd love to make again, glazes that I'd forgotten, potential paths that I never got back to following. It's fun to remember the specific details of my old studio, to see images of completed firings from many years ago, to revisit past events. I think it's hard to progress without remembering where you've been. 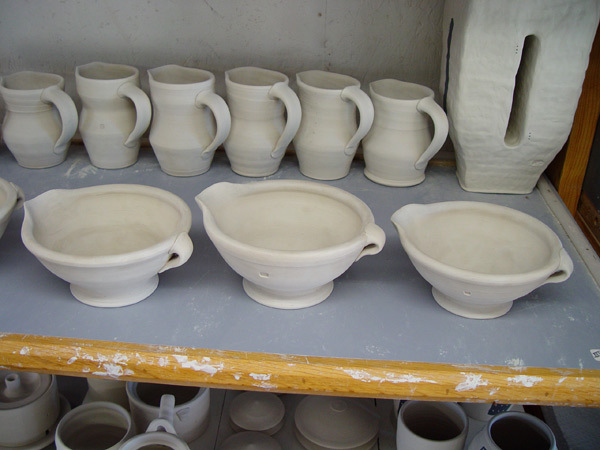 I made small pitchers this week, a form that's quite challenging to get all the nuances right. I really like them lined up on a ware board like this when they're done, the way the forms relate to each other, with the pouring lips and handles nested together. From left to right in this photo, they're in the order that I made them, which shows how a form can change through throwing in a series. The same is true with shaping the lips, pulling handles and impressing texture -- there are small changes from one to the next, often suggested by the last variation. On Wednesday evening, I finished trimming feet on some bowls. I've been thinking a lot about trimming the last few months. 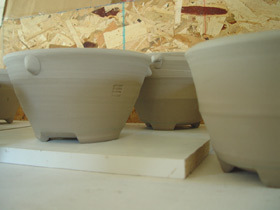 I only trim pots that have a foot, like bowls, plates and a few varieties of lidded jars; anything with a flat base is left as it comes off the wheel, to keep the gesture and skin of throwing through the entire form (and by "trimming", I mean using a metal tool to cut away excess clay at the leatherhard stage). I think I've slowly become too focused on precision and weight when trimming, and not enough on character and balance. This may be because the former qualities are easier to measure objectively, and the latter ones require more subjective interpretation. I really dislike a pot that seems too heavy at the base, compared with the rest of the form. I think it takes away from the experience of using the pot, physically lifting it off a table and sensing it's structure related to it's appearance and volume. So I usually err on the side of taking away too much clay than too little -- often putting a pot back on the wheel for one more turn after examining it in hand. The problem with this is that it makes for a fussy, almost paranoid approach to working, and can easily result in pots that are too "tight". Sometimes I think I've achieved a very consistent clay wall at the expense of trimming the vitality out of the form. 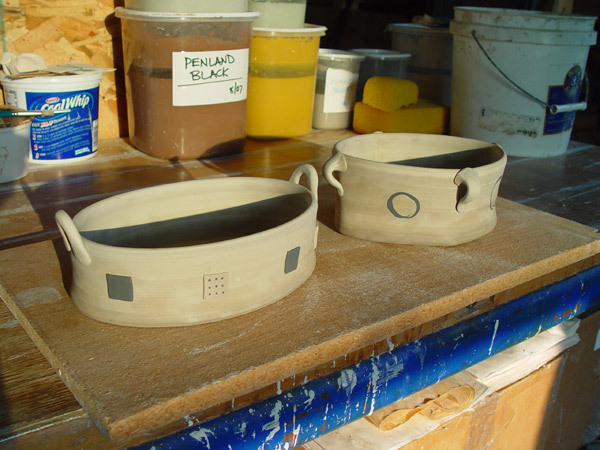 As with so much else about making functional pots, it comes down to finding a balance of opposites. The dayjob is going well. It's an adjustment, getting re-acclimated to spending most of the day at a computer. (For a while I had to resist the urge to kick my left leg to make the it go faster.) It's strange to be in a climate-controlled office again, the sterile Matrix of the technology workspace. Also strange to have other people around: to hear bits of conversation in the hallway, to run into people randomly on the street, to talk with friends over coffee or lunch. And very different to have a car commute again, driving to town each morning instead of walking across the driveway to the studio. I'm thinking more strategically about how to best use my time in the studio. 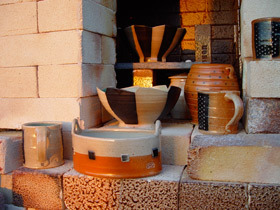 The workflow of making pots is defined by the fact that the clay is always drying out, and most processes, such as trimming a foot or attaching a handle, can only happen before it dries past a specific stage. Not being in the studio every day requires more planning ahead and careful control of drying. As I've said previously, this constraint is an old bag of tricks for me, but one I have to rummage through a bit to get sorted out again. This week at St. Earth I used up my writing energy on a new artist's statement, for the 30 x 5 show at AKAR Gallery that I'll be in this fall. So this week I'll put that here in place of the usual review of events and happenings around the studio. It's specific to my recent pots from the soda kiln, but it sums up my current thinking about what my work is about and what I want it to be. 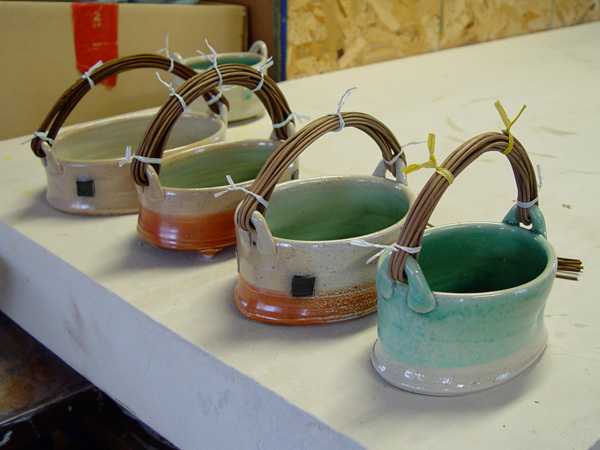 I first started making pots as a college student in 1992, and knew soon after that this was what I wanted to do. Throwing on the wheel revealed a desire to make things by hand that I hadn't experienced since childhood. The ability to have those things put to use in other people's daily lives seemed very significant. It still does. I love the inherent qualities of clay, and the processes by which it can be formed and fired to a near-permanent state. The act of making something out of virtually nothing is mysterious and enthralling. The material constantly offers unseen potential, yet with immediate signs of accomplishment and progress. 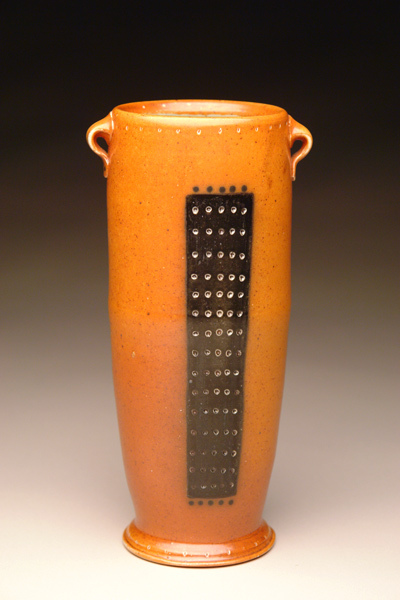 I aspire to make pots that are well-crafted, aesthetically interesting and enjoyable to use. Striking a good balance between these qualities is difficult. There's no formula for doing so, which presents both challenge and inspiration. While some of my pots are less obvious in their intended function, none purposefully deny use. The utilitarian vessel format defines very useful parameters for me to work within. 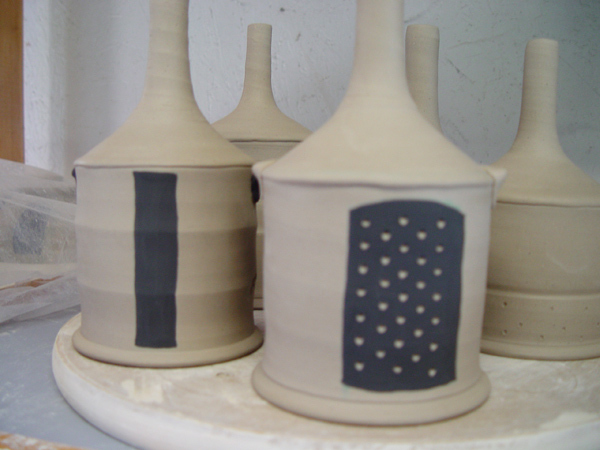 While there are many persistent qualities to my pots, I always have more new ideas than time to try them. The feeling of being perpetually en route to the next discovery is addictive. To achieve this, I'm constantly trying new forms, methods and surfaces. I explore possibilities in a process that mimics biological evolution, by making small, incremental variations in a series and evaluating the results. The successes are re-used in a variety of ways, spawning more possibilities; the failures are abandoned to the scrap heap of good intentions. This approach is well-suited to working directly and intuitively, with a general direction in mind but making decisions in the moment. I use it at every stage of the process: at the wheel, making alterations and finishing forms, applying surface decoration and during firing. With these pots from the soda kiln, the surface decoration is based on geometry and pattern, rather than representational imagery. There's no intended content or message to be interpreted. Instead, I'm looking for marks, texture and areas of color that enhance the three-dimensional form by interacting with the various parts of the pot. I'm intrigued by the numerical foundation of patterns -- the number of elements, their sequence and repetition, and the act of counting as I segment the form of a pot or apply individual marks. Adding these dots, lines and fields of color is like layering a somewhat more rational structure onto the abstract form of the pot. 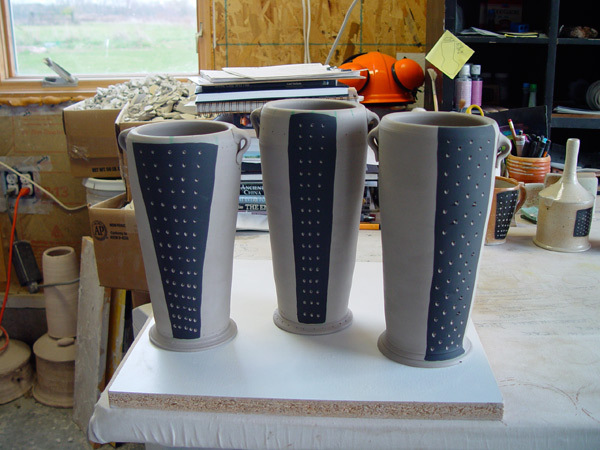 I will often decorate the entire pot -- top, bottom, outside, inside -- to emphasize that its three-dimensional form is more than just a canvas for a two-dimensional image. 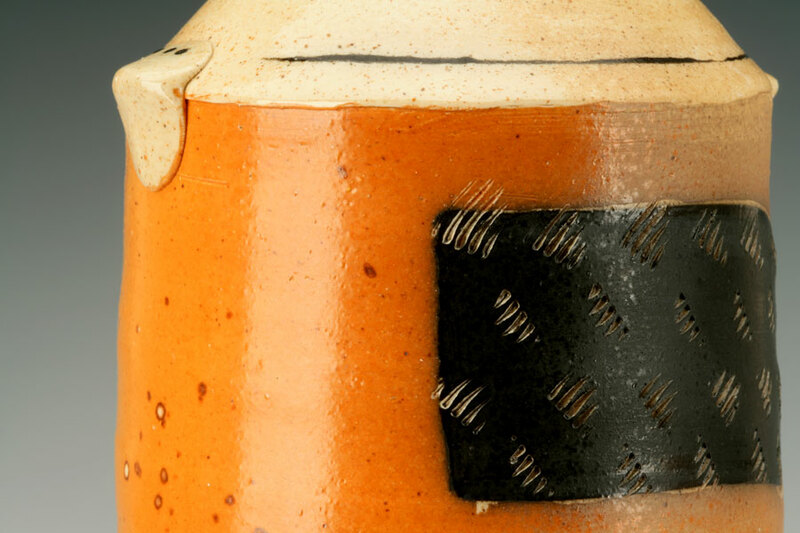 This also increases the possibility of discovery; finding an unexpected pattern on the base of a mug or inside a lidded jar is a reminder that this is a unique, hand-made object, and that some of its qualities can only be appreciated through use. The influences for my pots are a complex mix of the entire contents of my visual and tactile memory, from other art and objects to pop culture to the view of the rural landscape out my studio windows. These influences are often accessed subconsciously -- I don't know where they come from and, for the most part, I don't want to know. It's important to me to maintain some mystery to the making process, and I believe it improves the results. Ideally these intentions and working methods result in pots that reflect the time and place they come from, and that carry traces of their maker's identity. This week at St. Earth ends the first three months of this writing experiment. So far I've done 14 posts and uploaded about 50 photos. 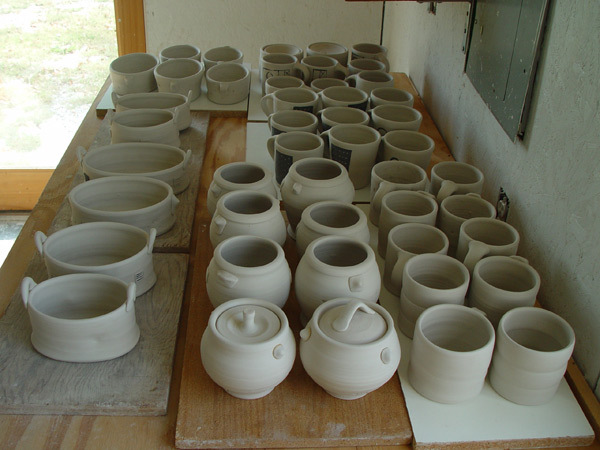 It's really enjoyable for me to look back through it, to see all the recent pots in progress and refresh my memory of all the things that happened this summer. I certainly hope that it's interesting for others too, and that it reveals what goes into making the pots and some of my ideas and experiences along the way. I have some sense of how it's being received from Google Analytics, a free tool for analyzing website traffic. It shows that since I started there have been 750 visits to this page from about 250 unique visitors. The average time on the site is over two and a half minutes, which is pretty good by web browsing standards. It's really gratifying to think that people are finding and reading it. One of Analytics most interesting features is the map overlay, which shows where site visitors are from geographically. So far mine have come from 22 countries, although most traffic is from the US. Almost all are from English-speaking countries, which is no surprise. The rest of the St. Earth site is more broadly international, with noteworthy amounts of traffic from places like Japan, France, the Philippines, Poland, Israel, South Africa, the Netherlands and South Korea. Even after working with the web for almost ten years, it's still somewhat amazing me that I can post these words and pictures here in Indiana and they're immediately accessible to the entire world. Seeing those dots on the map of a distant place just reinforces how powerful that really is. In the studio this week, I made oval baskets for the soda kiln, similar to the one pictured on the sale postcard last spring. These are an interesting form to make, with a lot of possible variations to the form and options for surface decoration. I've been adding small, thin slabs to them at the leatherhard stage, which makes a defined area for adding underglaze and glaze patterns. I really like them with small attached feet, too, which lifts the flat base off the table in a way that seems to defy gravity. 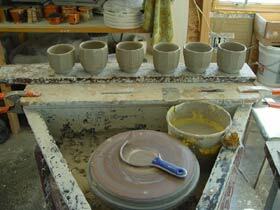 These can be tricky to get balanced with more than three feet, as there's always some movement as the pot dries. A tripod works best, but I prefer them with four or more. They look a bit strange from this stage until after the glaze firing, with the lugs sitting empty at the rim. I'll weave a cane handle onto the lugs as the last step, custom fitting the size and style of each handle to the details of the pot. On Friday evening Cindy and I visited Marj Peeler, which is always really inspiring. As I wrote in June, Marj and her husband Richard were local potters for nearly four decades, and are very highly regarded, as they should be. 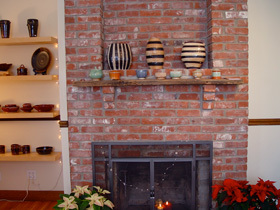 They built their own house and studio, and the entire property has the unique, handcrafted qualities of their pots and other artwork. It is a very tangible example of how they integrated life and art into one thing. Marj is starting to clean out the studio in preparation for putting the house up for sale next year, so she sent us home with tools, ware boards, and some pots from their collection. Over the years she has very generously given me tools, materials and equipment, so they can continue to be used by another potter. It's an honor to work with them. Visiting their studio, which hasn't been used since Richard died in 1998, prompts complex emotions. I never saw it when it was full of the activity of making pots, so it's bittersweet to explore and learn from now. 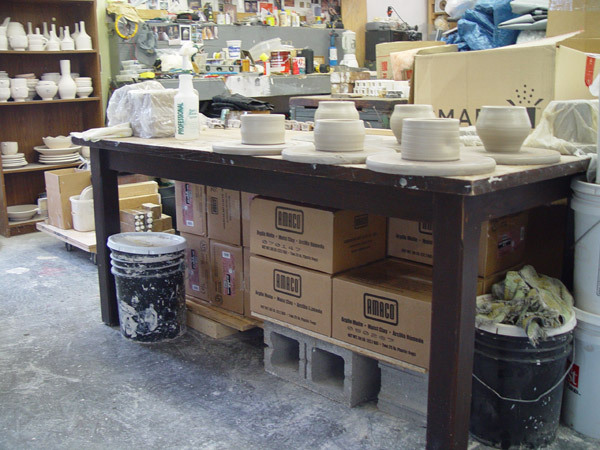 Some things are as if wet clay was moving around the shop just yesterday, like a shelf lined with throwing tools; others are dramatically different, like the missing wheels and kilns that served well for all those years. Being there, I can't help but think about how a potter's career ends, that one day these roles will be reversed and it will be me closing up shop and handing down tools to a younger potter, hoping to pass on some hard-won wisdom to go with them. It reinforces the fact that one only gets to make so many things in a lifetime. I'd better make what I really care about, and make them as good as I can. This week at St. Earth marks a big change. After a year and a half of being self-employed, I started working at the university again as a web developer. It's essentially the job I left in 2006, minus the management and supervision duties. This means I'll be doing things like design and technical problem solving, which in my previous six years working there are the things I liked best. The job opening was unexpected, and I took it because it seemed like an opportunity that was too good to pass up. The biggest draw is financial, of course. 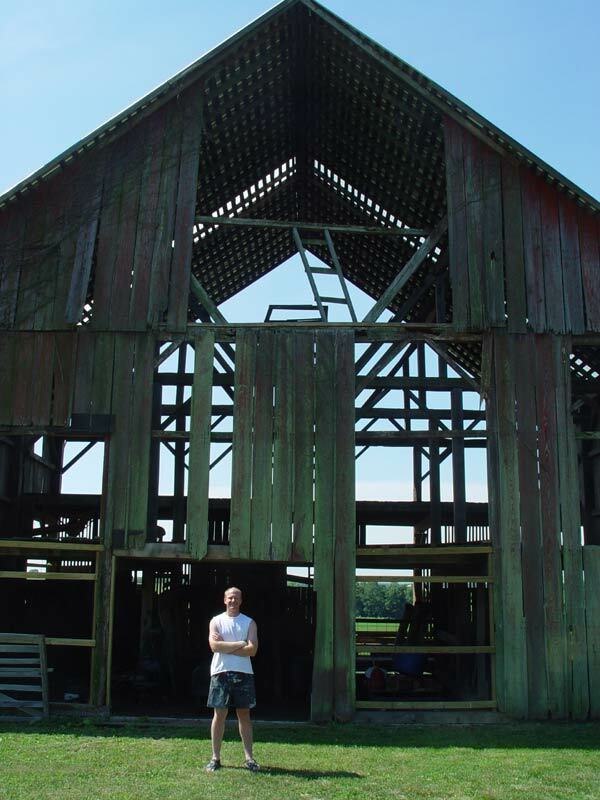 I earn a much higher hourly rate as a web developer than as a potter, so this opens up a lot of options, like saving money for upgrades to the studio -- kiln shed, larger soda kiln, barn renovation, etc. It also helps that I know the situation there really well, and that I'm working for people I genuinely like. I've been doing some freelance web design in addition to making pots, and I feel lucky to have it as a secondary career option. I want to keep those skills fresh (which is hard to do, given how fast web technologies change). So the job is a chance to do that and learn some new tricks along the way. The compromise is that I'm switching the majority of my work time from pots to IT for a while, and I'm certainly going to miss the time in the studio. The upside is that it's a return to a pattern I have a lot of experience with. This got me thinking about the dayjob/studio balance that I've had since I first started ceramics in 1992. 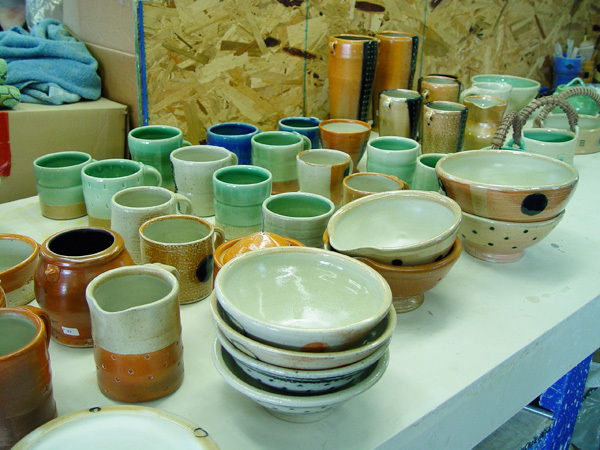 Some quick tallying indicates that in the last 15 years, I've been a full-time student for 3, primarily a potter for 2, and had a full-time job, in addition to making pots, for 10. So most of my time as a potter has been making pots during evenings, weekends and vacations. I've usually managed to be productive despite those limitations on time, so I don't expect any difference this time around. I will continue to have two studio sales each year, keep the showroom open by appointment, and have pots for sale on the website. There may be fewer pots at any one time, but I'll always have something available. 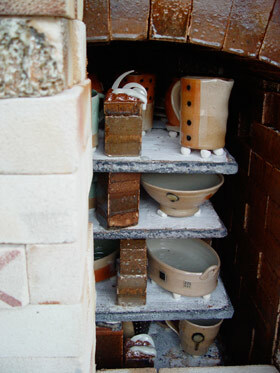 In the studio this week, I unloaded the soda kiln Monday evening. Most of the pots were good, but there were some disappointing results on the top shelf, including some of the pots I was most excited about. I lost about 20%, which isn't a tragedy, but is a much higher loss rate than I'm happy with. Fortunately, there were some really good ones on the lower shelves, so it could have been worse. Technically, the problem was caused by a couple factors. Because of the changes I made to the metal stack after the last firing, I was more cautious with the damper this time -- too much reduction can make my black underglaze bubble, which pretty much ruins any pot it's on. 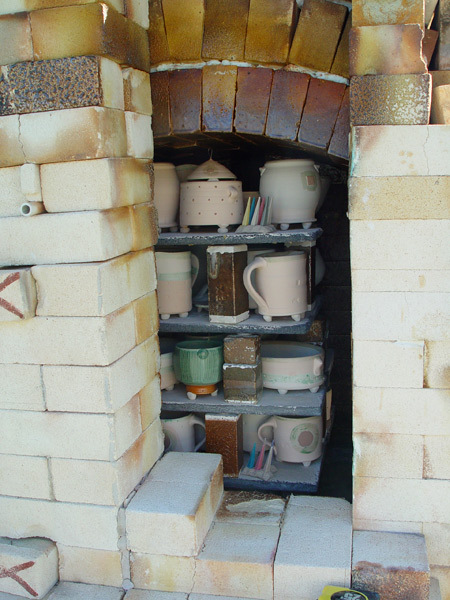 However, I went too far in the other direction, with the damper open too much, which in this kiln creates a bigger temperature difference from top to bottom. Ordinarily, this would show in the cones during the firing, but the cones in the top pack shifted and sort of fell over, which made them look more melted than they were. (The pyrometer isn't much help here, as I've had cone 10 over at wildly different temperature readings in previous firings). 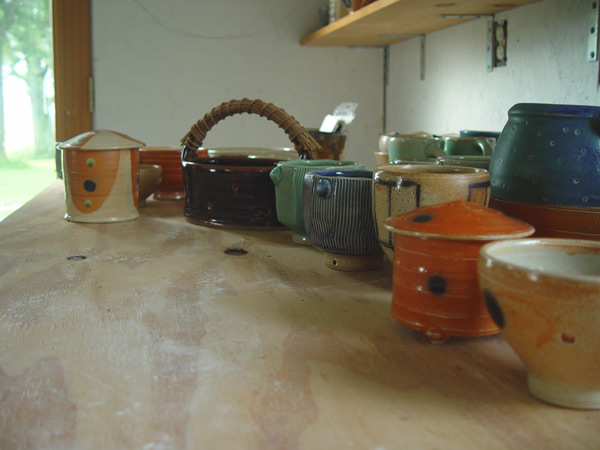 So, the top shelf was underfired, which means some otherwise very good pots came out with dull, unfluxed glazes. I'll try to refire a couple of them in the next load, but haven't had much luck with that in the soda kiln. I think setbacks like this go with the territory of making pots (or any art form, for that matter). I'm usually discouraged for a couple days, and then ready to try again. The key is to make a good attempt at figuring out what went wrong, come up with a plan for how to avoid making the same mistakes later, and then get back to it. You can't solve a firing problem without more pots to fire. 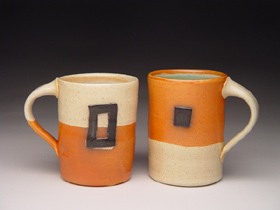 I made mugs on Saturday, and finished them on Sunday with handles and some underglaze decoration. I've been thinking about focusing on one form for a longer stretch of time, say a couple days or a week, as my tendency is to switch to the next idea just as I'm starting to lock in on the current one. (I wrote about this topic some back in 2003: How Much Diversity is the Right Amount?). 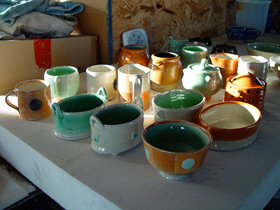 This week at St. Earth I unloaded a very good firing from the soda kiln, glazed another batch of pots, loaded it back up and fired again on Saturday. I also made a few pots, put cane handles on teapots and baskets, and worked on the siding plan for our barn restoration project -- a lot going on. Unloading a glaze firing is always exciting. There are pots I can't wait to see, variables to resolve, new things to discover. After all of the work to get the pots made, glazed and loaded, and then to fire the kiln, there's a lot invested in energy and hope. 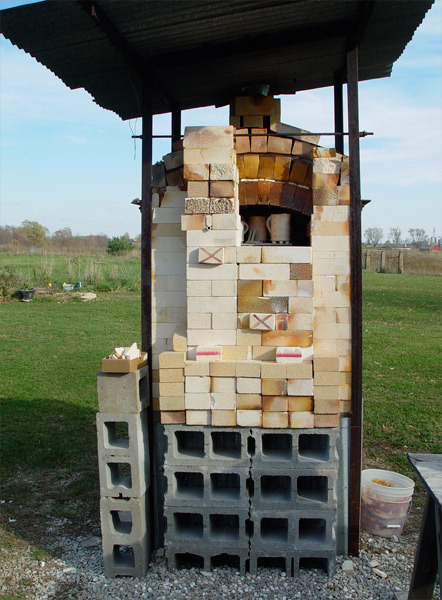 My kiln has a interior layer of hard brick, which really holds on to the heat, so it's much easier on the structure of the kiln to let it cool slowly for an entire day before opening it up. That can be a long wait, and it just adds to the suspense as the door bricks start to come out. There are a lot of things that can go wrong in the glaze firing -- cracks, warping, glaze drips, missing the ideal temperature or atmosphere. 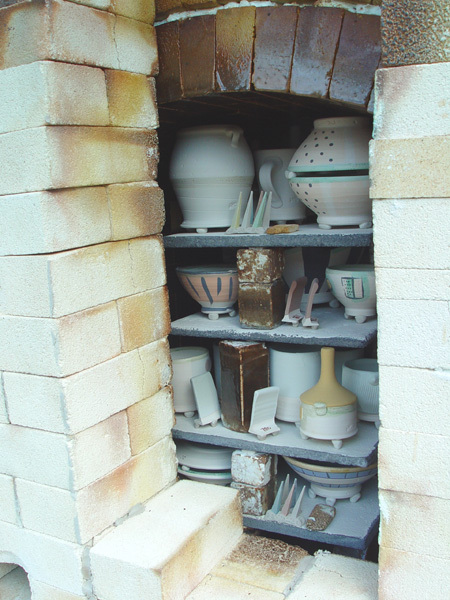 (Appeasing the kiln gods is a mysterious art.) 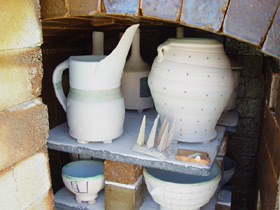 With salt/soda firing there's the added variable of the vapor glaze, which moves around the kiln differently with each firing depending on how the pots are stacked, how the soda was sprayed, where it interacted with glazes, and so on. I'm looking for those organic markings that record the path of the flame on a pot, written in melted salt. They don't have to be dramatic -- and sometimes they're best as just a subtle trace -- but that's what I hope to see, the element of chance overlaid on all the things I put there on purpose. My glazes are working well at the moment, which is at least half the battle. 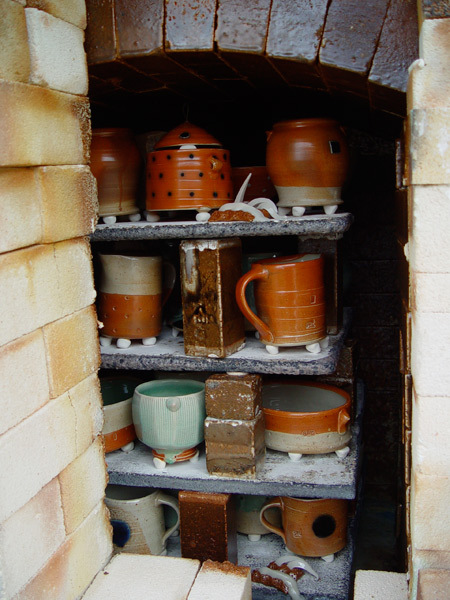 I've done a lot of glaze testing and development since I built this kiln in late 2005 and it's starting to pay off. I'm particularly excited about a new pale green celadon and a glossy, deep black. Both contrast well with the bare clay and soda marks. It really inspires me to know I have a good palette of glazes and surface effects to use. I think my best pots are the ones that start with a complete idea before I even wedge the clay. This lets me make the most of the interaction between parts of the form, and between form, texture and surface, because I know where I'm going at each step in the process. 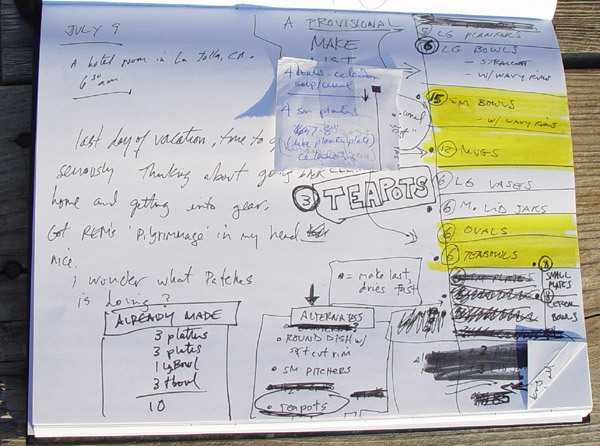 Certainly, there can be too much planning -- and I'm always holding open space for the unexpected or accidental -- but I've come to believe that starting with a picture in my mind really improves the final pots. 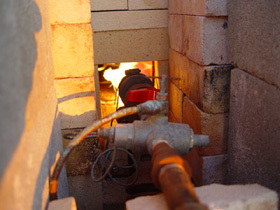 The technical and mechanical challenges to firing a gas kiln to over 2300°F are constant. The thermocouple on the pilot burner (which keeps the safety valve open when it senses flame) burned out right at the end of firing. It was the strangest thing: the kiln was at temperature and I was letting it soak a bit; 10 minutes later, I went to shut it down and the burner was already off. A few moments of panic ensued, but no harm -- it was like the kiln knew the firing was done. Apparently they tend to die at the end of firings, so I'm really glad this one lasted as long as it did, instead of going off at, say, cone 7. That would have been ugly. There are times when then necessary tasks of making pots reminds me what I love about it. Like getting up in the dark to start the kiln, the full moon shining off the roof of the barn and dawn just barely on the horizon. One of the many things that make firing days, and being a potter, special and strange. This week's tunes: Wilco, Coldplay, Bill Frisell, A New Found Glory, The Postal Service. This week at St. Earth was productive and varied. I made some pots (mugs and jars), cleaned kiln shelves, glazed and loaded the soda kiln, mixed glazes and glaze tests, set out reclaim clay to dry, cleaned the studio, added photos of new pots to the site, and helped shoot more photos of Peeler pots at the local museum. As I write this on Sunday morning, the kiln is firing up -- currently at about 1500°F. My glazing process for the soda kiln seems to be getting more complex. After 21 firings in this kiln, I'm still not getting quite what I want from the vapor glaze on the bare clay and slips, so I'm doing more layering of the surface, often with wax as a mask to define areas of the pot with glazes. This is a lot more labor-intensive than applying a single slip or glaze to the whole pot, but I'm really drawn to the graphical/decorative potential. (I seem to keep going towards more variation and detail on each pot too, rather than for simplicity or uniformity.) One thing I love about soda firing is that glazes can easily be used for accent, rather than covering the entire form of the pot -- dots, squares, lines, splashes. It's also fun and challenging to do surface decoration at the glazing stage and over top of previous marks made at the wet stage (stamping, carving, black underglaze, etc). 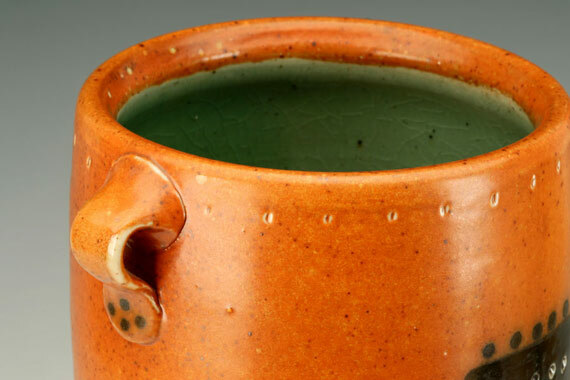 The contrast between unglazed clay or slip and a glossy glaze is intriguing, and the changes caused by vapor glaze build up and flashing can create some really interesting results. 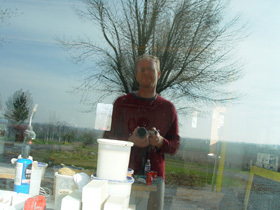 It seems I'm part of a growing trend in potters writing about their work online. I met Emily Murphy at her studio at the Lill Street Art Center in Chicago last spring. She's making some great soda fired pots; I bought one of her mugs from Haus Gallery and really enjoy using it. 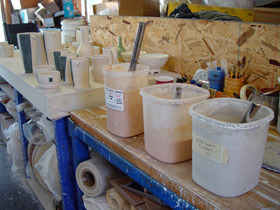 Her blog is also very good, and she recently wrote an annotated list of potters' blogs. There are currently 44 blogs on it (including this one). This is a fantastic number, particularly with the variety of styles and working methods represented. I remember that as recently as 2005 there were just a handful of them, so this is great progress and yet another vast array of good online reading waiting in the wings. Speaking of potters and technology, the most useful resource I've found on the web for researching technical issues are the massive archives of the Clayart listserv, a group discussion that covers nearly every topic related to ceramics and has been going for years. The downside of such a large volume of content is filtering through it to find what you're looking for, which is where the wonders of Google's search engine come in. (The built-in search on the Clayart site is OK, but limited.) Google has an easy way to do a targeted search of a site -- essentially filtering out results from any other sites that would normally appear in response to a search. Here's the trick: just add the text "site:potters.org" to your search terms. This asks Google to return results only from the potters.org domain. This week's music: David Grey, Green Day, Whiskeytown. This week at St. Earth I got back in the studio and started building up momentum again. This reminds me of the heavy concrete flywheel on a human-powered kickwheel: it takes a lot of effort to get it started spinning, but once in motion it's much easier to keep going. The law of inertia seems to apply to my studio process the same as it does to physical objects. 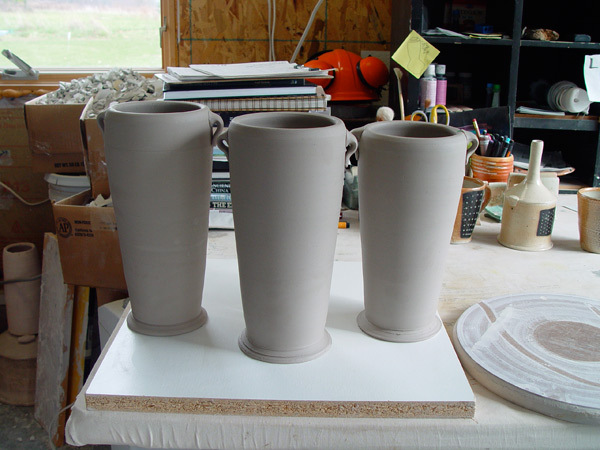 To start making pots for the soda kiln, I switched from clay fresh out of the box to reclaim clay. This is the stuff that's been used once and scrapped as trimmings or broken greenware, then dried, slaked in water to a slip, and re-dried to throwing consistency again. The clay is much better after going through this cycle -- more plastic and forgiving, easier to throw. I like this recycleable property of clay: until it's been fired, every little scrap can be reused endlessly. 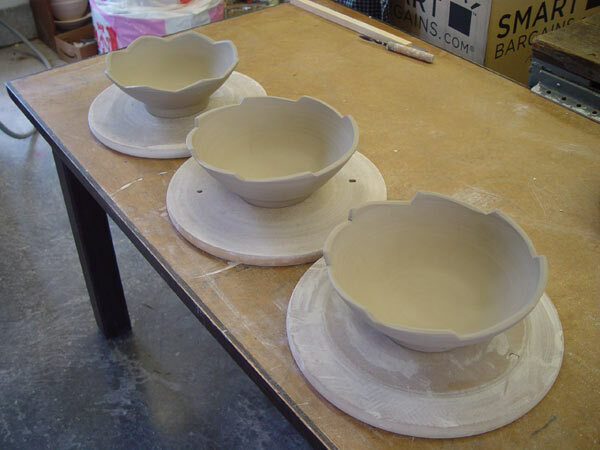 I made oval dishes and mugs, skipping teabowls for warmup because I already have a bunch of them on the shelf waiting to be fired, and my throwing chops didn't feel too rusty after the time away from the wheel. The ovals are like a previous one that turned out quite well, which is something I've been doing more deliberately. When I have a really successful example of a form or surface on a finished pot, I set it aside in the studio, then start a new series of exploration with that as the prototype. Even minor tweaks and variations can make a big difference, so the results are like a family that share the same genetic makeup, but not identical traits. 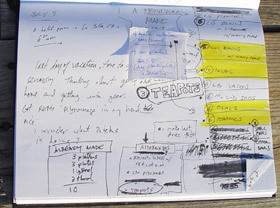 This seems to be a good way to develop ideas, and particularly to remember small details that I would otherwise forget. What's the point of exploring if you can't recall where you've been? 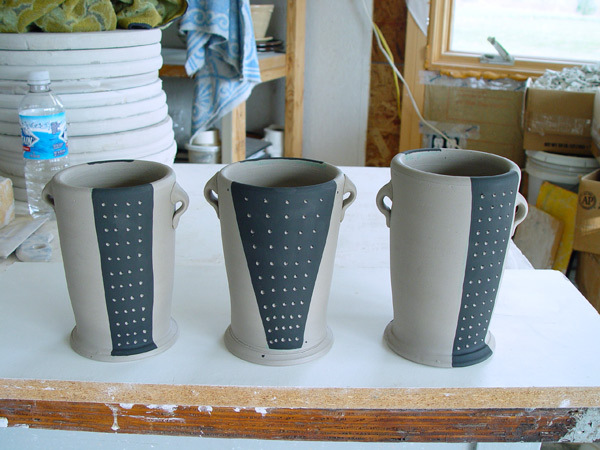 I decorated the mugs with a pattern I'm calling "domino"; black underglaze brushed on while the pot is still leather-hard, then dots carved back through to the white clay underneath. (I suppose this is a kind of sgraffito technique.) It's a nice effect, especially when the black gets really glossy from the salt, with the dots in high contrast. 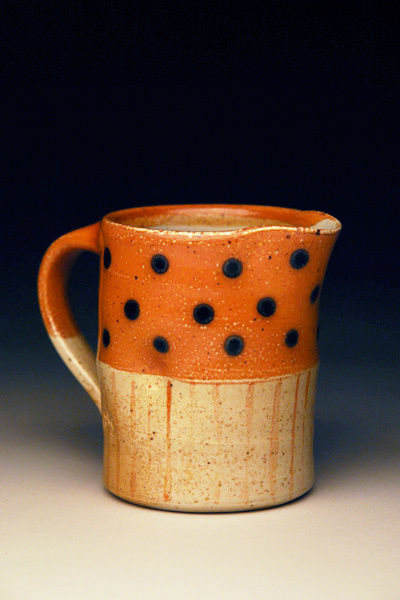 I really enjoy varying the shape of the black "box" relative to the form of the mug, and the pattern and frequency of the dots. Lots of possibilities there. 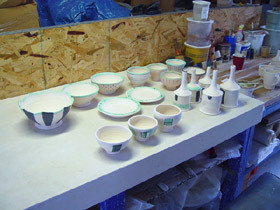 The studio was badly in need of an organizing and cleaning session so that I could start glazing for the next soda firing. 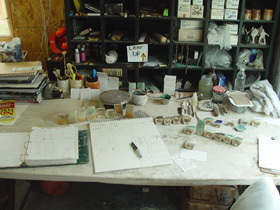 The past few months I've been so focused on making pots that the associated junk piled up all around my main work area in the studio, overtaking horizontal space and clogging walkways. I always procrastinate on this until its almost too disorganized to work, but it sure is nice to get it done, like taking a big full breath. 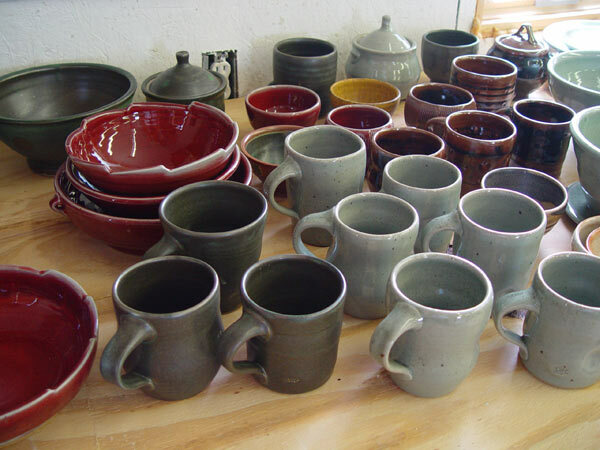 I have enough pots for at least 2 soda firings on the shelf as bisqueware, so I hope to glaze and fire twice in succession in the next couple weeks. Lastly, if you'll indulge me in some meta-analysis, I seem to be falling behind on this writing endeavor, each week posting it to the site a bit later than the last. (My ideal plan was to write on Sundays, then edit and post on Mondays.) The more significant the topic is to me -- like the trip to Iowa -- the harder it is to write about, so I spend a lot of time refining the previous week's entry. This is probably just my ambition getting in the way, but I'm surprised at how hard it can be to communicate an idea well enough to capture it's essence. I hope I'm succeeding at that more often than not. This week at St. Earth wasn't quite what I'd expected. I had planned to start a new cycle of pots, but the first part of the week was delayed by resting a sore back, the relentless August heat, and some projects that I'd neglected in July. 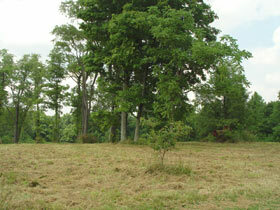 The grass just keeps growing. Then late in the week I decided to go with CIndy on a road trip, and we spent a long weekend out of town. So, no pots this week and just a little studio time (which makes me kind of anxious), but getting caught up on things outside the studio is a necessity and the trip was really great. We went to Iowa, about 300 miles diagonally across Illinois, and stayed with Cindy's mom in her hometown of Muscatine. I also spent a night at my cousin's house in Burlington, where we stayed up late playing guitars like in the good old days. Saturday was one of those days that's so full of experiences that my brain couldn't process it all. In the morning I went to Iowa City, where we lived for three years during undergrad and where I first started ceramics. Wandering around town was a huge dose of nostalgia: looking at the wood kilns behind the ceramics studio, going past old apartments, jobs, hangouts and other places burned into my younger memory. It's been almost 15 years gone by since then -- hard to believe. One thing that's new since then is AKAR Gallery, which I think is one of the best ceramics galleries in the country. I've been invited to be in their annual 30 x 5 show this fall (thirty potters, five pots each), which made it even better to see the gallery in person. 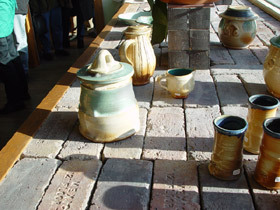 I hadn't been there in several years, and was amazed at both the number of pots on display and the consistent quality. In addition to the featured show there were about 40 artists' work on display, including many of the potters I admire the most -- a very representative selection of some of the best American potters working today. I spent over an hour going from shelf to shelf, picking up nearly every pot within reach. It's almost impossible to overstate the value of this as a means of study. As great as museums can be, there's nothing like being able to handle the pots as a way to learn from another person's work. Putting your hands where their hands were; feeling weight, balance, texture and tool marks; seeing decoration and glaze details at close range -- these are the fundamental things about pottery that distinguish a great pot from a good one, and that are almost impossible to gauge from a photograph or behind glass. AKAR's website is also a great resource -- easily my favorite gallery site. The site design and photography are excellent, and all the past shows are archived there (going back to 2002). Just like the experience in person, that's a huge amount of information to study and absorb, and I'm very pleased that they don't remove those older shows from the site. They just get more valuable as time goes on. As if that weren't enough for one day, in the afternoon I went to visit Clary Illian, a great potter and mentor, and probably a bigger influence on my pots than anyone else. Clary apprenticed at the Leach Pottery in England in the early 1960's, and has been a potter for over 40 years. I had the good fortune to work with her for two summers after graduating from Iowa (1994-95), with a year of postgrad at Arizona State in between. This wasn't a typical apprenticeship, in that I didn't work for her in the studio or work on her pots. 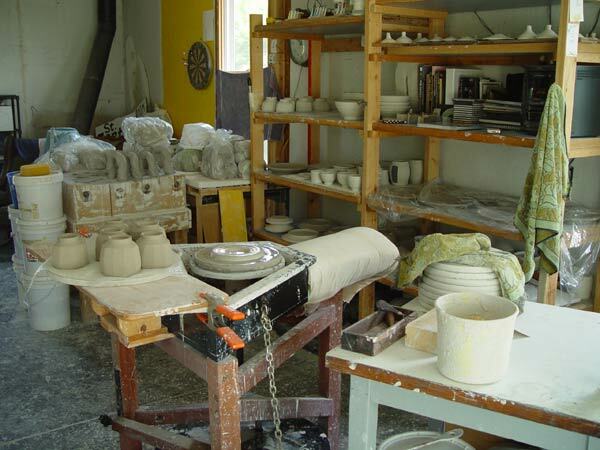 In fact, her generosity is such that the benefits were skewed largely my way: in exchange for house-sitting and minding the shop for a few weeks each summer while she was away, I got a place to live, studio space, kiln access and instruction. Most importantly, I got to see the details of what it means to be a potter up close and over an extended period of time; an excellent view of the whole endeavor. That was my link to the Leach tradition of utilitarian pottery: she encouraged me to try the treadle wheel, advocated "the majesty of form", and never let me take the easy way out. She reinforced my belief that making utilitarian pots is a valid form of artistic expression, and without that experience I'm not sure that I would have ever tried to do it as a career. In the years since, I've set up my studio and business following her example in more ways than I can count. We talked about a wide range of things: dogs, books, my barn renovation project, earthenware, soda kilns, never having enough pots in the showroom, Warren MacKenzie's retrospective show, potters at AKAR, how time gets spent on the various aspects of making pots, etc. As always, it was greatly informative and inspirational. I foolishly forgot my camera at home, so this week's photos are from a trip to Clary's yearly sale in November 2003, and one of her pots in our collection. I've been taking much more deliberate notes about glazes. Each batch has a page in my glaze book with details about it's current status: when it was mixed or last refilled, how it's been firing lately, suggestions or changes to make to it. While glazing the pots, I make notes about how they were applied, particularly how long each was dipped (some glazes are sensitive enough that there's a big difference between three seconds and six seconds in the glaze bucket). After each firing, I make detailed notes about how each glaze worked. Much of this is just supplementing my flaky memory, but like with firing logs, it really helps to go back for detailed info later about how to repeat successes or to help diagnose a problem. 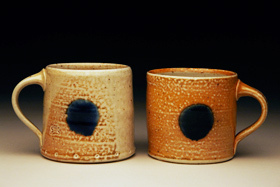 I'll take photos and add new pots to the site gallery sometime next week. I found a new clay supplier about an hour north of us in Lafayette, and on Friday went to get some premixed porcelain clays to test. The #38 white stoneware from Amaco I've been using is good, but has some limitations; I'm looking for a body that fires closer to a true white, in hopes of developing a transparent/white glaze and having a wider range of options with Celadons. 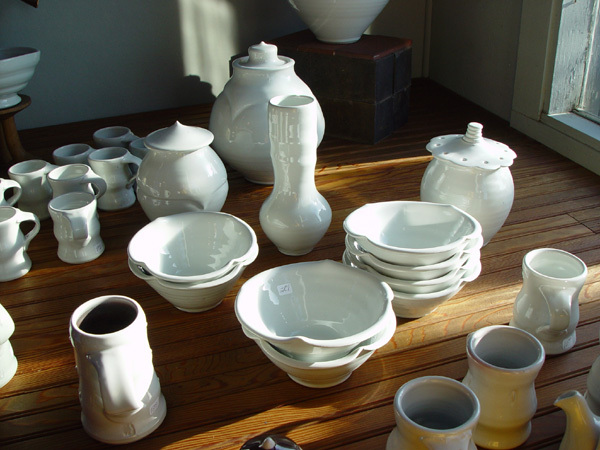 I got some of Tom Turner's porcelain from Standard, and two other porcelains each -- an English kaolin version and a domestic version -- from both Standard and Laguna. That's 5 new clays to test, and I'm looking forward to trying them out. So I spent the first half of the week mixing glazes, glazing and loading; then fired and unloaded the kiln, made a run for clay and finally took a couple well-earned days off. This week at St. Earth I finished the last pots of the throwing cycle, fired the electric bisk kiln twice, processed reclaim clay and started glazing for my firing next week. I made lidded jars, planters, cereal bowls and salad plates (3 + 3 + 9 + 8 = 23), which means I've made about 80 pots in two and a half weeks. That's a very fast pace for me. It's great to be able to tune out other distractions and projects for a while and just focus on going to the studio every day and making pots. 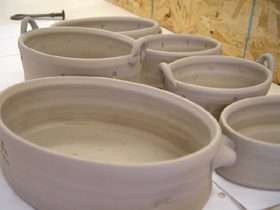 Getting into the flow of the work makes the pots come faster without compromising quality. I'm feeling pretty good about my productivity and the resulting pots. The lidded jars were a new form, inspired by a photo of a Bill Van Gilder teapot, but also owing a lot to jars by Byron Temple and Sandy Simon. Straight sides, a tight skin made with the metal rib, trimmed foot with a notch in it, stamped, dome lid with a Nichrome wire handle. At least that was the idea... one of them came out just right; the others are close, but I'll have to refine the details the next time around. I really enjoy having a new form to explore. 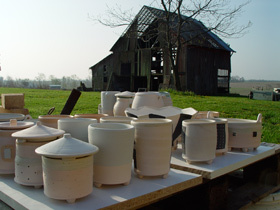 I talked on the phone with North Carolina potter Ron Philbeck this week about salt kilns. 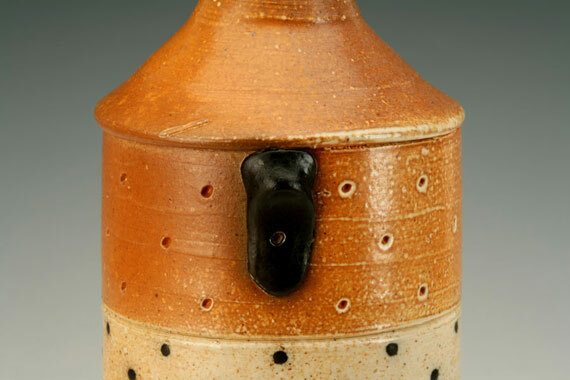 He makes really good pots -- salt fired stoneware, graceful throwing and strong forms, with minimal glazes and direct, lively decoration. We share a branch of the Leach/Hamada/Mingeisota tree of utilitarian pottery, with many of the same influences. It's very interesting to meet other potters who have similiar goals, and helpful to talk about the various challenges to making good work. Ron also keeps a great blog about the daily adventures of being a potter, which helped inspire the decision to start my own. (There's nothing like having a good example to work from.) 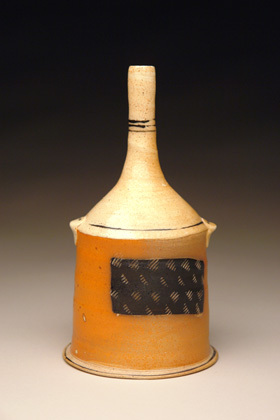 I particularly like seeing his photos of pots in the studio and the before and after shots of his salt firings. I was thinking about how easy it is to fall into the trap of hurrying while glazing -- trying to finish and get the kiln loaded. Even when it's just completing routine tasks, after all the aesthetic decisions are made, rushing through it can only diminish the result. As I said last month, there are so many variables to glaze firing that there's no guarantee that any one pot will succeed. 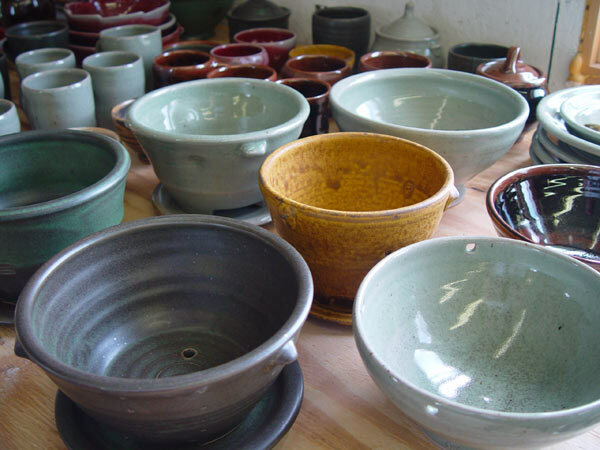 Lots of excellent bisqueware can become merely average pots during the firing, and most often it's because of poorly applied glaze. All you can do is give the pots a chance to be great. Taking shortcuts in the process reduces this chance for greatness to near zero. And that's probably true at every stage in making, from calculating a clay or glaze recipe to waiting for the cones to drop. As with so many other things, fast and good are mutually exclusive qualities. I try to remember this when I'm tempted to get to the next stage faster, to speed dry pots or quick cool a kiln. These things are possible -- they can be done with some experience -- but they are adding risk to an already risky process. It only has to go wrong once to erase any benefit of all the times I get away with it. It also takes more effort to do it the hard way. Patience is well-known as a virtue, but for potters I think it's also a necessity. It takes as long as it takes. This week at St. Earth was quite a productive one in the studio. I made oval dishes, small lidded jars, large vases, teapots and serving bowls (6 + 6 + 6 + 4 + 3 = 25). 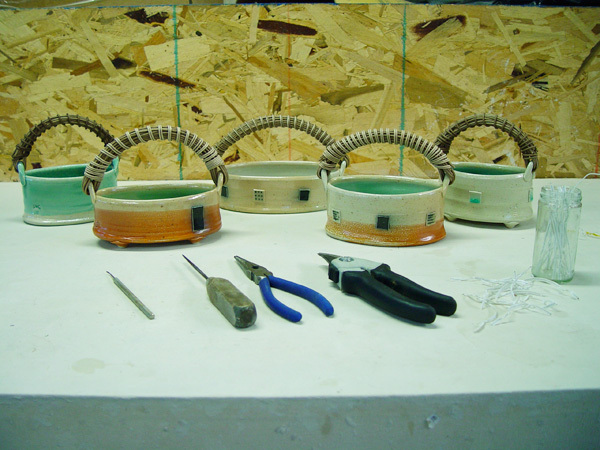 These were more complex pots this week, after getting back into the throwing groove last week; ovals and teapots are assembled from multiple parts, vases are thrown in two sections, teapots and jars require lids, and so on. This means more time spent on each pot (and proves the inherent problem with counting my output, since it fails to consider quality or complexity). On Tuesday I went to Amaco in Indianapolis for a load of clay -- 800# of it, which is as much as the car can carry and should last me several months. It's great to have that much raw material around the studio waiting to be made into pots. Reinforces the feeling of potential. I started buying premixed clay a few years ago when I realized a major supplier was less than an hour away, and it's worked out pretty well. I particularly like it once it's been through the reclaim cycle; it gets very plastic and nice to throw the second time around. I discovered a new definition of "high humidity" this week: when 10 hours later the pots are still as damp as when they came off the wheel. It was one of those midwestern summer days when it's like the rain is hanging in the air and can't quite fall. This was very strange, and left me with a lot of pots to finish up late in the week. I keep finding reasons to not take Sundays off. The last morning of our vacation in San Diego, I wrote out A Provisional Make List, something I'd never done before, but had been considering since hearing Warren MacKenzie's description of it in that interview a few weeks ago. Typically, my plans for the next firing have been vaguely in the back of my mind, perhaps a few sketches or notes, but nothing explicitly stated. Naturally, this means they are always too ambitious by half, so that I'm regularly disappointed when it's time to call it quits for the cycle and move on to glazing and firing. 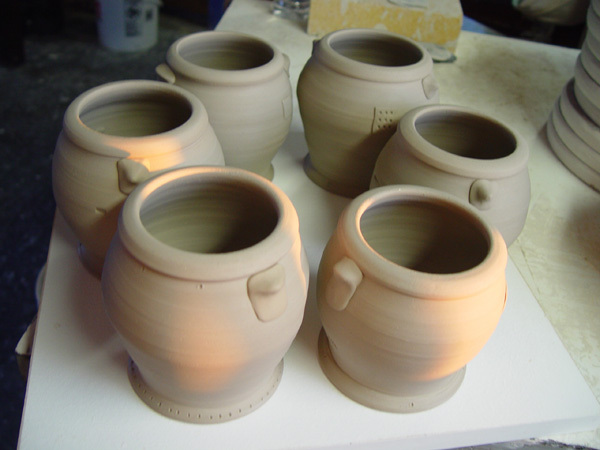 This approach has also conveniently let me put off making the harder pots indefinitely; I'd get the easier ones done and then run out of time for the more ambitious and experimental stuff that I aspired to. Over time this adds up to a lot of missed opportunity to tackle challenges and get better. So for a change I made a list and gave MacKenzie's approach a try. Even having not yet completed the throwing cycle, I can see that it adds clarity to the process. It reinforces discipline while remaining flexible -- I was really sold by MacKenzie's idea that on any given day he can make anything on the list that sounds interesting. I added an "optional" section too, other things that could be traded onto the list as desired. And I started with numbers that are a rough approximation, so if a certain form is going really well I'll make more of it and if not I can move on to something else. All of this may seem like a small thing, but in terms of my working process and habits it could be a huge change. 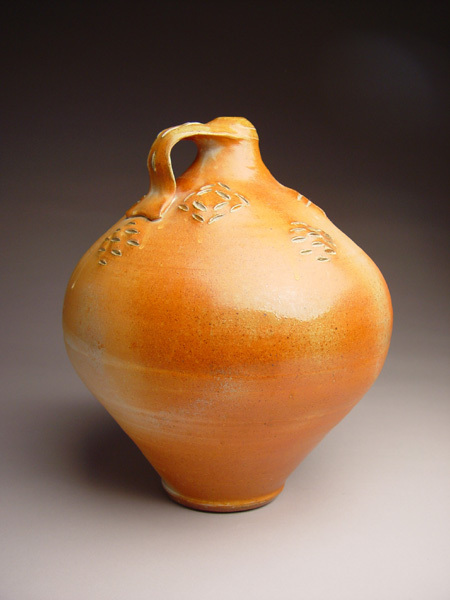 These are the kind of things that can best be learned from the experience of other potters. Add them up over the years and it becomes a whole way of working. Along with all those hours in the studio goes plenty of good listening from the iPod. Here's what I heard this week (with links to the podcasts, if you're interested). Natalie Merchant, The Fray, XTC, etc. 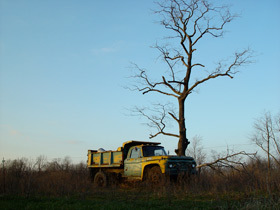 This week at St. Earth we came home to ankle-high grass, head-high corn and beautiful spring-like weather. After almost 3 weeks away from the wheel, I got back to the studio and started a new cycle of pots. I made teabowls, lobed cereal/soup bowls and mugs (6 + 15 + 12 = 33). 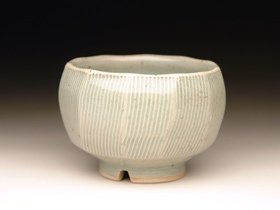 I like making teabowls to warm up, especially using soft clay. It's a familiar form, one where many of the mechanical details are embedded into muscle memory. I love this idea, of the body learning things and knowing how to do them without needing conscious attention. Everyone has it as a consequence of repetitive experience, from breathing to tying shoelaces to finding the right frets on a guitar. With something like making pots, it can free up the conscious parts of your brain to focus on improvising and exploring. Each teabowl can be like a quick sketch in three dimensions -- very close to the idea for a pot and the actual object being the same thing. I'm following in some mighty big footsteps here. Clary Illian once told me about seeing Peter Voulkos do a workshop. The part she liked best was that he warmed up by making teabowls, just like she does. Very interesting. Even after 15 years of throwing on the wheel, there's a hint of uncertainty when I've been away from it a while. Throwing has never quite lost that initial sense of mystery, and with that goes some uncertainty about the outcome. "Can I make it happen again?" So teabowls are a good refresher -- a way to get a feel for the clay again, to clean off my tools, flex my hands and check that things are in good working order before moving on to greater ambitions. They fill a ware board quickly enough to be reassuring, but not so fast as to be meaningless. In fact, I'm often surprised later at how good they are, especially when they capture that loose, gestural quality that I hope to get into all my pots. 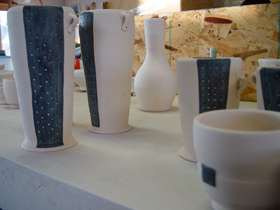 This week I also took photos from the last firing and added them to the site Gallery. There are about 25 new pots there, representative of about 150 pots currently available for sale. 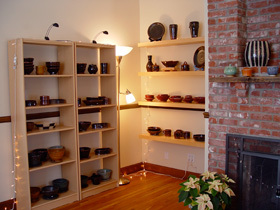 The showroom is open year-round by appointment -- contact me if you'd like to arrange a time to visit. This week at St. Earth I went to San Diego on vacation, so I made zero pots. I had a great time resting, seeing family, going to the beach and eating top-quality mexican food. But as good as it is to get away, I always regret lost time and momentum in the studio. It takes a while to get into the patterns of working, to warm up my throwing skills and get my thoughts to where I can make good decisions and have good ideas about the pots. After a week away from wet clay for glazing and firing, and then 10 days out of town, I'll need to ramp back up next week. I grew up in San Diego, and what’s strange to me now is how my old hometown and my new one are so different. It's like the bizarro world of Fillmore, where everything is almost its polar opposite: landscape, weather, people, culture. It made for a strange, informative shift in perspective. As a kid, I easily spent dozens of days per year at the beach. When I’ve been away a while, I forget how great it is to float in the ocean and play in the sand, or to walk along the coastline. I took a bit of the studio experience on the road with me, by making sandcastles; an inspiring creative change-up. I used a technique we called “drip-mud,” although there’s no mud involved, just a slurry of wet sand. 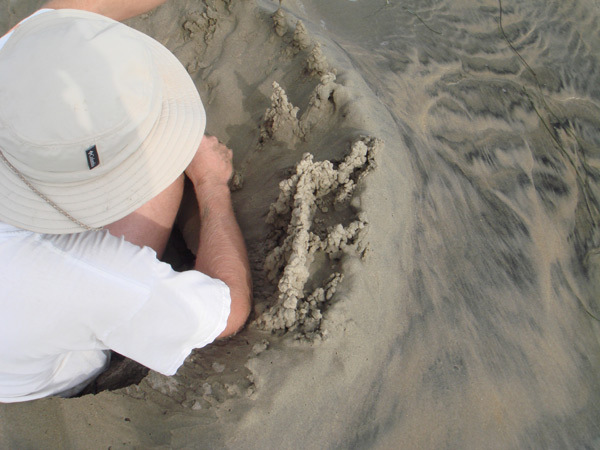 I have no idea where this idea came from, as opposed to the method of packing sand into a bucket. I think of it as the kind of thing a child does naturally, but that an adult typically avoids for being too random, visceral and sloppy (not to mention fun). My 8 year-old self made things that usually looked like a cluster of half-melted pine trees or a rejected Gaudi mock-up, but my 36 year-old self found it easy to believe that great things were possible with some effort and experimentation. 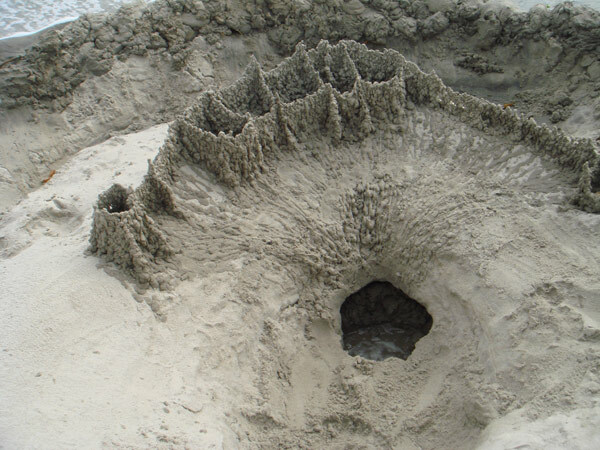 What I find really interesting is how what seemed simple as a kid now seems so complex and full of potential; beach sand can be used as an artistic medium, just like almost anything else. And I was surprised to find so many similarities to working with clay, particularly to throwing. The most obvious is that it’s a plastic material; because it starts formless, it’s like making something out of nothing. Then there are built-in limitations on what shapes it wants to hold and what scale is possible without heroic measures. Like clay, the sand slumps, warps, twists and falls if pushed too far. Design is accumulative; elements can be changed later by adding and subtracting, but only to a certain extent. Good results are possible working mostly with bare hands; there’s the same direct contact with the material and attention to subtle gestures. The sequence had many parallels, too: pick a spot, build a foundation, dig a hole for water, plan what you’re going to make; these seemed like mixing clay, wedging, setting out tools, deciding what to make, etc. 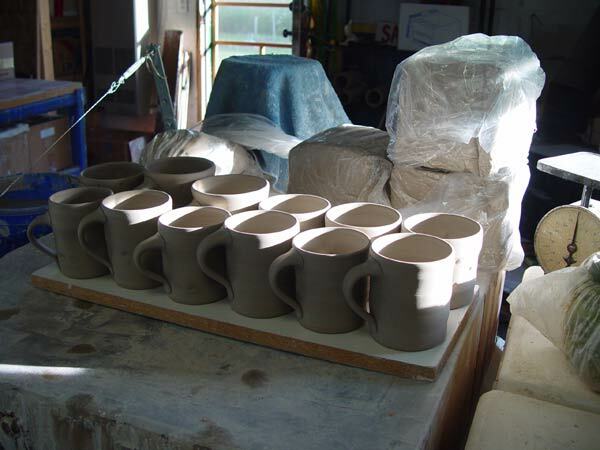 Like throwing clay, it’s an exciting process, and I could hardly make myself stop. Most intriguing to me is how both share the element of time. Decisions are made on the fly, without much advantage to reworking. The best results come with a direct, momentary touch on the material. Each second there are new options to explore and the material is always changing, shifting state as it dries, so that you have to adapt to it’s schedule. And with sand there's the added excitement of the incoming tide, of working to some satisfactory end before it vanishes into the sea. This reminded me that everything we make is temporary, even pots. Some are just more temporary than others. This week at St. Earth I did a glaze firing, which is always an intense experience. 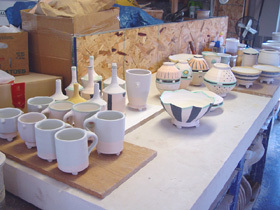 Two days glazing and loading the kiln, one day to fire, half a day's rest and then unloading. The firing was quite good -- a few great ones, mostly good, the usual handfull of disappointments and oddities. So I have a nice batch of new pots, ready to go into the showroom as soon and I clean and price them. I'll shoot photos and update the site Gallery in the next week or so, too. 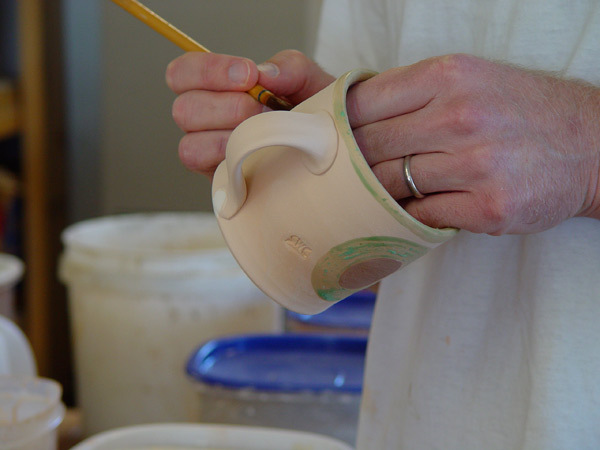 Glazing -- applying a liquid glaze to the porous biskware -- requires precision and concentration to get right. I glaze by dipping and pouring, which works best with a direct approach and doesn't leave much room for correcting mistakes. Like throwing, I need to be focused on the moment and the pot in hand. I've realized over time that it pays to be patient and work at it slowly; most attempts at speeding up the process just result in bad pots. 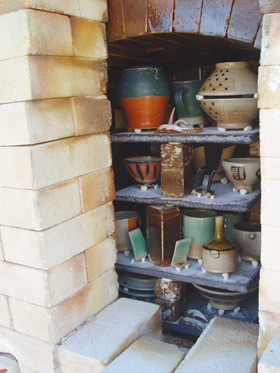 Loading the kiln is like a reverse game of Jenga; stacking the shelves and bricks is an engineering puzzle that has to withstand 9 hours of intense heat. Each glaze works best in a different zone of the kiln -- top or bottom, at the edge of the stack near the burners or close the the center -- so I think a lot about the ideal arrangement based on the pots I have, their sizes, and which glazes I've used. 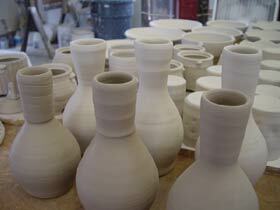 Firing is only one part of the making process, but in many ways the most critical one. With so much work already invested in the pots -- and so many expectations -- it always seems that more can go wrong than right. There are many complex variables involved, and even the best potters have only partial control of them. 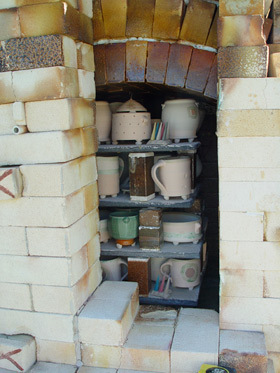 Risk and uncertainty are built into the medium, particularly when firing to high temperatures in a fuel-burning kiln. Last year, after one really bad firing, I wrote on the wall of my studio: "The fire must have its say." The day I finished loading the kiln, I had an odd thought while filling up at the gas station. "If I buy a lottery ticket and scratch it off the before opening the kiln, maybe it will dissipate any bad luck that might be floating around looking for a place to land...?" I realize that given my previous comments about numerology, I must be starting to sound like a crystal-wearing mystic, so I'll take a moment to note that I am a firm proponent of scientific principles and rational thought. Really. But there's something about the unpredicability of glaze firing that prompts these superstitious impulses. Perhaps it's a way of deflating the seriousness of the situation, keeping the anxiety at bay until I can actually see the results. So I bought a lottery ticket. Unlike the vast majority of people who waste their money on these things, I actually scratched off the boxes hoping I wouldn't win anything, which was fun. (I'll take any chance I get to buck the system.) By the internal logic of the experiment, winning would use up the available good luck, thereby increasing the chances that something went wrong in the kiln. 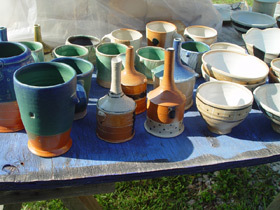 Happily, I scratched the boxes, didn't win anything, and the firing was good. Now who's crazy? Outside the studio this week, our neighbor -- a farmer who's been very generous helping these city folks learn to live out here in the country -- brought over his tractor and brush mower and cleared off our back 5 acres and the old pasture in front of the barn. The landscape seems remarkably different, especially since it changed so fast. What was previously waist-high weeds and grass is now clear fields, all the way to the treeline and bordering cornfields. Even in the dead of winter it's never been so wide open, which enhances the already excellent views from atop our small hill (rumor has it that we're the 2nd highest point in the county, but we're working hard to get to 1st next season). This week at St. Earth I finished up a three-week throwing cycle for my next glaze firing. 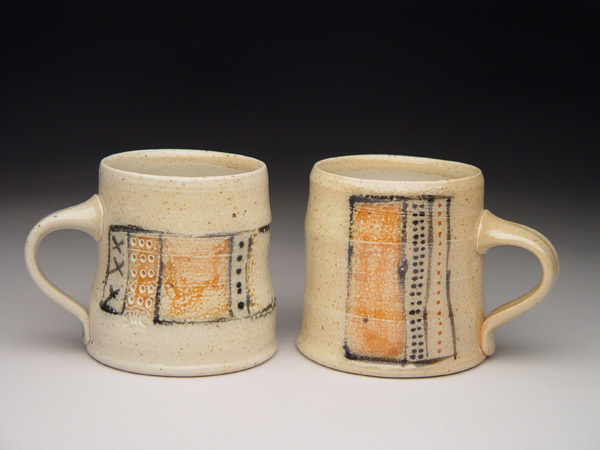 I made mugs, lidded jars and vases: 12 + 9 + 6 = 27. 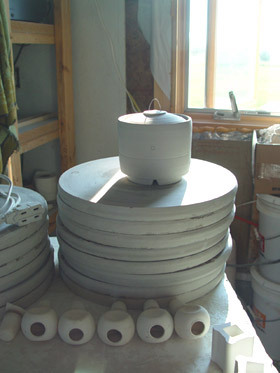 I cycled the electric kiln twice - about 100 pots in all. After 4-5 solid weeks of making pots, I love being in the studio, surrounded by them in every stage of production: some just finished under plastic, some bone-dry and waiting to go into the bisk kiln, others ready for glazing and the final stage: trial by fire to 2350°F. It's great to be physically surrounded by the results of my effort. I was thinking that there aren't many professions left where you can set out the results of a week's work on a table and see what you've accomplished. A hundred years ago, the opposite was true; there weren't many jobs which didn't produce a tangible, physical outcome (whether it could be set on a table or not was another matter). My friend Dan told me once about a study which found the highest job satisfaction among masons, supposedly because at the end of each day they could see clear, measurable feedback of their work in the new rows of bricks they had laid up. Whether this is true or apocryphal, I think it suggets a fundamental disconnect of most work these days -- it produces mainly virtual, intangible results which don't satisfy our hardwired need for physical proof of our actions. On the other hand, perhaps this isn't a universal need, and it's just that people like me (and those masons) are better suited to making things than performing non-physical jobs. In my years as a web designer/project manager/supervisor I was always most frustrated by a day spent answering email or attending meetings, even if a lot of problems were solved or issues were addressed. It never felt productive in the way that working in the studio does. Looking at a list of "Sent Mail" on a monitor just doesn't measure up to a row of freshly thrown pots. In fact, I'd say much of the allure of being a potter to me is its clarity of action and reaction. There is a profound quality to translating the thought of a thing into a permanent object that exists in the world and must be reckoned with. The immediacy of it draws me back to the wheel, wanting to see what happens next. The magic of clay is that it's like making something out of nothing. So I set out a couple week's pots out on a table and I can see the results of all my decisions, the hours of work put in, the good and the not-so-good results. It's like a map of exactly where I've been, and that's really gratifying. The clay remembers things for you, once you've put it in place, and in a way I'm standing there looking at a table full of stored memories, soon to be transformed into stone which will hold it's form for about the next 30,000 years. Sometimes it's as deep and mystical as all that. And sometimes it's just making coffee cups. On Saturday, Cindy and I did a volunteer gig taking photos at the local museum, in conjunction with a retrospective exhibit there for Richard and Marj Peeler. The museum invited people to bring in examples of Peeler pots from their collections, with the idea of building a photographic archive of their work. The Peelers are legendary around here, both for their artwork and how they've lived, and I'm happy to help remember that legacy. It was really interesting to see a range of their pots spanning over four decades. The earliest marked with a date was from 1959; the latest I saw was 1993. At an estimated 10,000 pots a year between the two of them, it's stunning to think of the range and depth of work that came out of their kilns in that time. (Marj says this may have been an exaggeration on Richard's part; even so, that's a lot of pots!) Just as interesting - and very encouraging - was to see how enthusiastic people were about the pots they owned, how much they were valued. If 40 years from now someone still likes the pots I made yesterday, I'll consider that success. This week at St. Earth the summer heat arrived, calling for shaded windows, iced drinks and careful fan placement in the studio. I've been time-shifting my work day closer to dawn, to get in a few hours while it's cool, and am starting to like being up at first light ready to go. It was a good week of making pots. Continuing last week's numbers theme, I worked in groups of six: platters, which I hadn't made in years, large bowls with carved rims, more faceted teabowls and mugs. 6 6 6 6. (To keep up the sequence, I guess I'd have to do 3's next week. We'll see.) Including finishing last week's plates, this made for a ton of trimming, so I spent most of the time at the wheel. I really enjoy having several consecutive days in the studio without too many outside distractions. 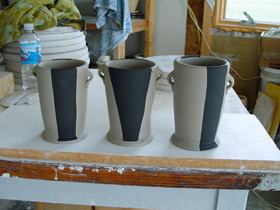 It helps me get into the flow of making, where one group of pots can evolve from the last. It makes sense to throw plates one day, then increase the size and make platters the next. When I get a good sequence of pots going, they also go through the various stages of drying with time to catch them at just the right moment to take the next action, like putting on a handle, stamping texture or trimming a foot. (This is much easier than coaxing them to dry faster or slower to fit a forced timetable.) And it adds clarity to the process too -- if I make mugs today, then I know I'll be putting on handles and finishing them tomorrow, and so on. The days move along and the shelves slowly fill up with new pots. I'm gradually rearranging furniture and stuff in the studio to improve workflow; adding tables, consolidating junk and optimising workspace. On a lark, I turned my treadle wheel in the opposite direction the other day, and it's amazing how much difference that can make. The light changes, the view out the window shifts, the music comes from another direction. It's good to tweak my brain and encourage new perspective. Sunday morning I broke with my convention of trying to spend one day a week not in the studio to finish the last few pots I couldn't get done Saturday evening. It was fun -- felt like getting ahead of the curve a bit, even though I was actually just catching up. Deciding when to work, how much, and what amounts to a reasonable amount of time off are still in flux. I'm trying to be as productive as possible without wearing myself out in the process. Other activities this week included firing a bisk in the electric kiln, processing reclaim clay, and getting a load of firewood -- it's very strange to be thinking about how to stay warm when it's 95 degrees outside. 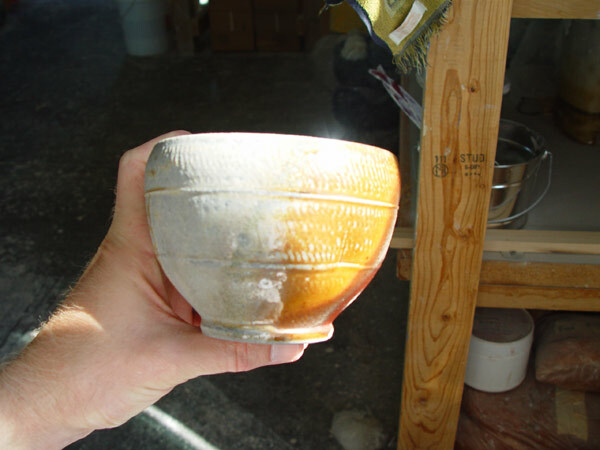 My favorite story from the MPR interview was about MacKenzie's family using pots they owned by Shoji Hamada, until three of them were broken in the span of one month. "'That's a fortune in pots -- a fortune we never had.' I said at the end of the month, 'OK, no one breaks a Hamada pot again,' and we haven't to this day." "Making pots is a job, you know? It's a job like going to the office -- except it's far more exciting to me." You just have to hear the emphasis in his voice to get the full effect. Lastly, the Smithsonian Archives of American Art has an online collection of artist interviews, including one of MacKenzie that I'm currently reading. The interview with Michael Simon, which was excerpted in Studio Potter last summer, was fantastic; the depth that these long-form interviews go into is really gratifying. There are at least 20 interviews of ceramic artists to date, including Robert Arneson, Otto & Vivika Heino, David Shaner and Paul Soldner. It's nice to see our tax dollars at work on something good. This week at St. Earth was quite unusual. After fighting a summer cold all last week, it was great to get back into the studio with some energy. 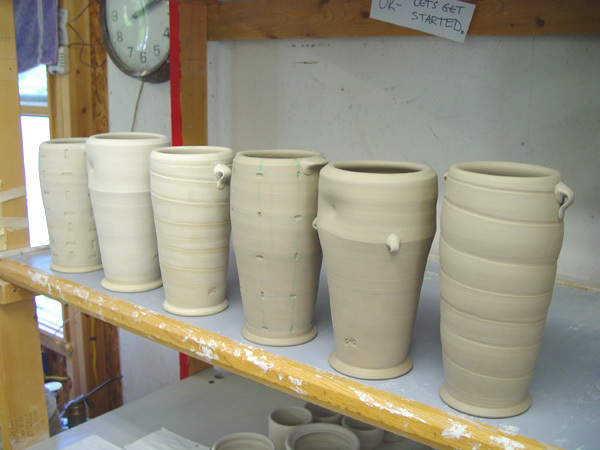 I made pots in nines this week, which started as coincidence but was then too compelling to stop. I have this psuedo-numerology thing going in the studio, which plays out most superstitiously in the number of each form I make on a particular day (and often in decorating, but that's another story). It's very useful to work in series when throwing, with quantities varying from form to form. Typically, I'll make more of a small or relatively simple form, like mugs or small bowls, and less of larger or more difficult forms, like vases or teapots. But this week I made serving bowls with carved rims, planters with cut feet, large dinner plates and faceted teabowls -- nine of each. The last two groups are still waiting under plastic to be finished; lots of trimming to do on the plates. Freshly thrown pots can sit for several days before they're too dry to complete, but I prefer to make them one day, let them sit overnight and finish the next. 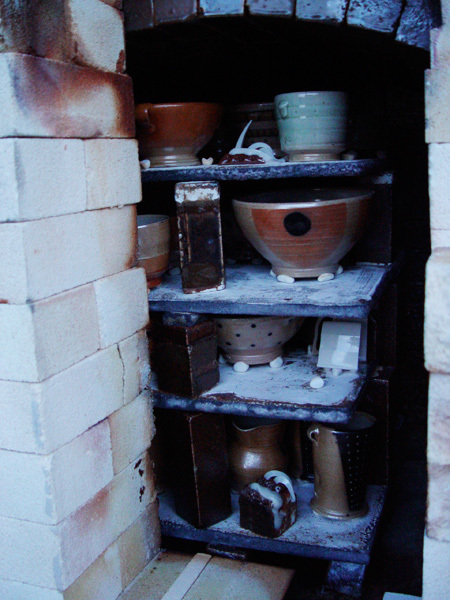 I loaded a bisk into the electric kiln with the pots from May to clear up some shelf space. There weren't a lot of them, since I spent time after the spring sale on the barn roof, a trip to Chicago and being sick, but I think there's some good stuff in there. I'm a sucker for the transition times in the the workflow of the studio like this; the cyclical rituals of going from one phase to another. Moving a few weeks worth of bone dry pots from the shelves into the kiln is a good example; they come back out transformed. I get a lot of satisfaction from the tangible sense of progress mixed with a hint of nostalgia for a moment gone by. In a typical week, I don't get away from the studio much - a few trips to town for groceries, a meal out, or the gym - but this week I nearly overdosed on external inspiration. 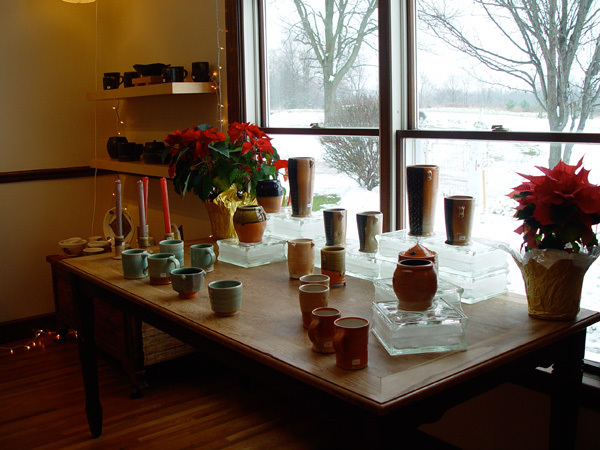 On Monday, I visited Unzicker Brothers Pottery, an hour north in Thorntown, Indiana. It's the studio of two brothers - Tom and Jeff Unzicker - who are great potters and have an inspiring commitment to woodfiring. 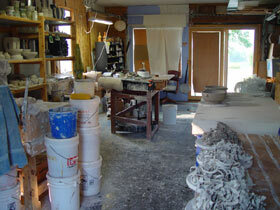 I absolutely love going to other potters' studios. It's so interesting to see how they do things, the way their space is arranged, what tools they use, the pots in all stages of making. The Unzickers recently built a huge wood kiln, something of a hybrid between a southeastern groundhog and a Japanese anagama. It's large enough that we could walk inside and sit around talking, which hints at the size and quanity of pots that it takes to fill it. I'm amazed that they do this just between the two of them, three times a year -- that's an impressive amount of pots. They recently acquired a large lot of kiln shelves and firebrick, which prompted my trip; I got some to test, with ideas towards my future salt/soda kiln. I also brought home a pot for the collection, a very nice teabowl with a rope-impressed pattern and some sweet ash and flashing on it. Then Cindy and I went to Bloomington on Thursday. We visited Dale Enochs, a sculptor who taught at DePauw several years ago, and who's studio we've been planning to go see ever since. 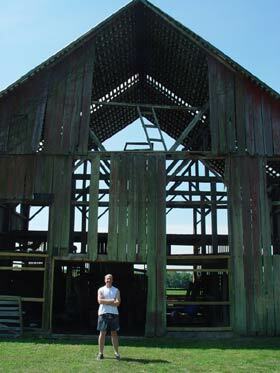 He has a fascinating place -- an old farmhouse, a yard full of his stone and metal work, and his studio in an old barn, which was very inspirational for our ongoing barn project. I'm always looking for role models in other artists, people whose experience shows another avenue of possibilities, and Dale is certainly one of these. He's been an independent artist for over 25 years, and is now working on large scale public commissions that are really interesting. Seeing the infrastructure required to move huge blocks of stone puts what it takes to make pots in a very different perspective! I took a new batch of my pots to Prima Gallery for their upcoming summer show and, as I tend to do there, acquired yet another new pot. This one is a Jeff Oestreich teabowl that Cindy bought for my birthday. Since I'd been stalling on choosing a gift, it worked out just right. 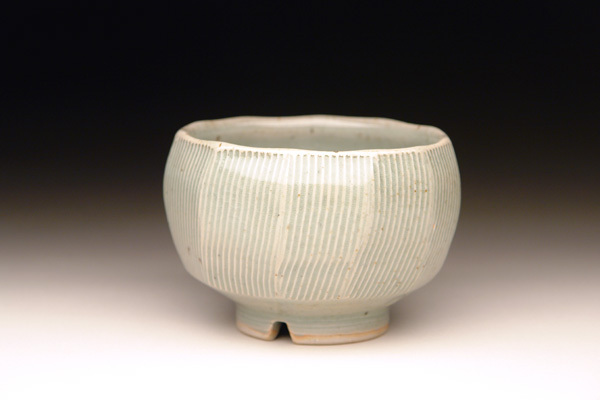 It is a great pot: porcelain, fired in a soda kiln, a satin jade celadon glaze over facets that each have several grooves, giving strong vertical lines that the glaze breaks over to white. Each facet is actually two cuts, with a change at the middle of the pot - a small, diagonal ledge of clay where the cuts meet (from the inside, there's even a bit of translucency where the cut into the clay is thinnest). Overall, it has a hard-edge effect that shows a really impressive control of the process, but somehow without being too tight. To me it's a perfect pot, but not the cold perfection of something completely uniform -- there's an organic variety to the throwing, trimming, cutting that looks right and feels great in your hand. 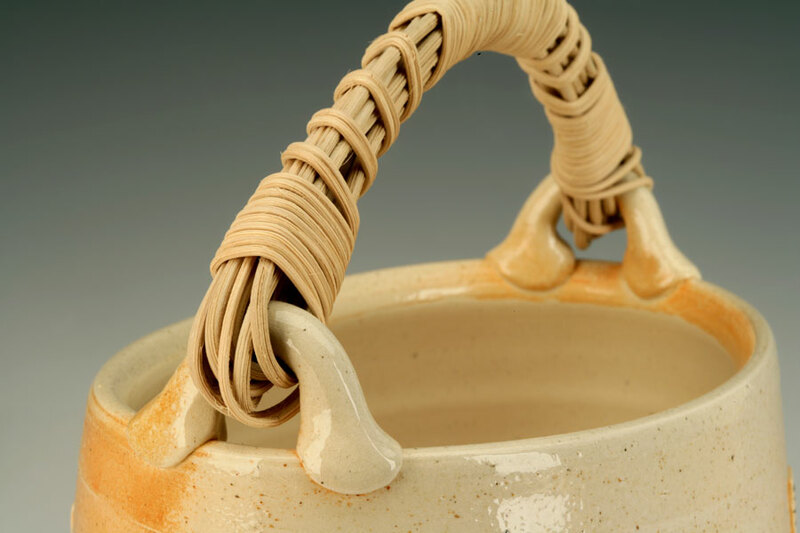 It shows a sureness to his touch on the clay that just can't be faked, the kind of result that is earned only by thoughtfully making pots for thirty or more years. 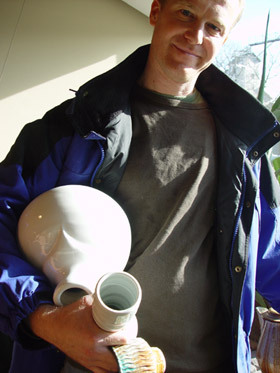 It's probably clear that Oestreich is one of my potter heros. I've wanted to have one of his pots for a long time, and now I do. Good gift. So yes, I had another birthday: #36. 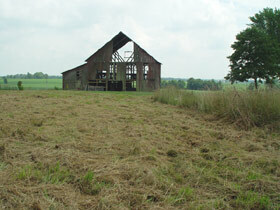 I persuaded Cindy to take my picture out behind our barn -- here's the current state of the rennovation. It's a newly-sound, squared-up frame with a shiny new roof, but without much in the way of siding yet. 2008 will also be it's centennial year -- we saw a photo with "1908" painted up in the south gable when it was new. That's really exciting. Someday, it will be a great place to show pots. Lastly, after a few months of consideration I decided to start this new project, writing about events and ideas from the studio. I have some general ideas about its purpose and intent, but will keep them close to the vest for now so as to avoid making a bunch of empty promises. I am, however, planning to keep at it once a week for at least a year (that's 52), and we'll see what it becomes and if the results are worth reading.